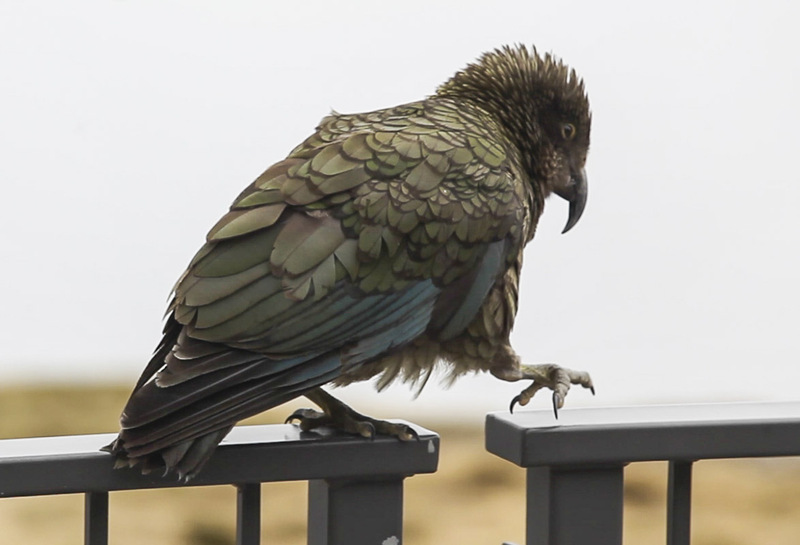 We now have several of the Kea video sequences uploaded to the Vimeo site. Let us start with the unedited “Live Parrot Silly Walks and Squawks Sketch”. Its not necessary to say any more about this here. You will find some background blurb beneath each opening frame. Here are a few more – at this stage they are just the unedited sequence as filmed. There are many more to come and the plan is to assemble a film sequence incorporating the best segments. A few of these do not have a good soundtrack unfortunately. Each sequence was originally filmed in HD and the iridescent plumage details etc generally look amazing. I’ll have more for you soon. 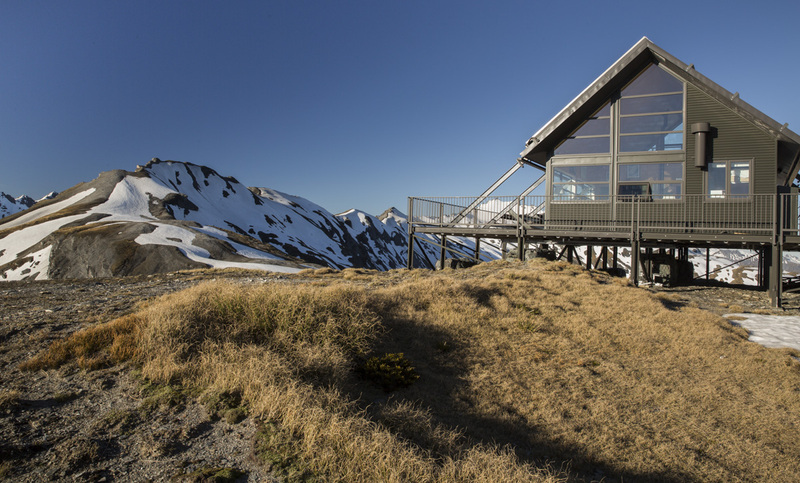 The Southern Skyline from the Whare Kea Chalet on the Albert Burn Saddle – Tititea on the right. 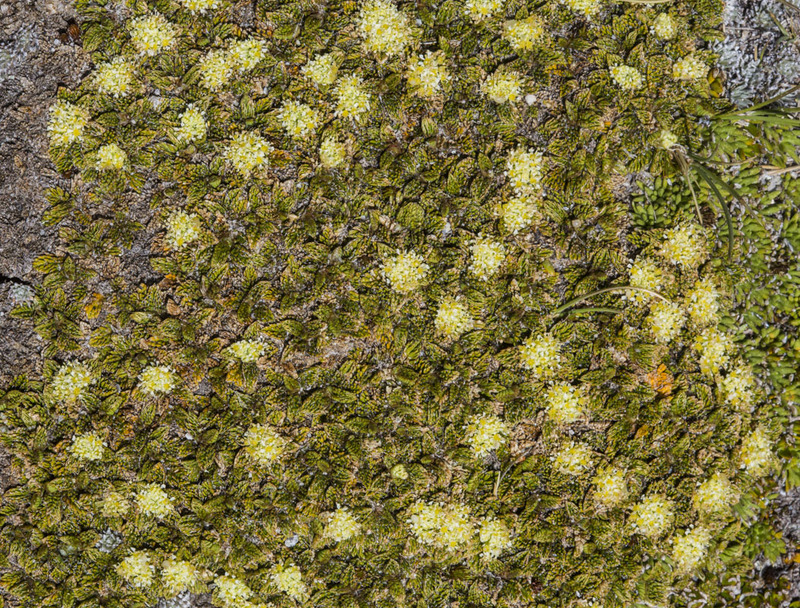 Click on any static image on any post to view at full screen size resolution. 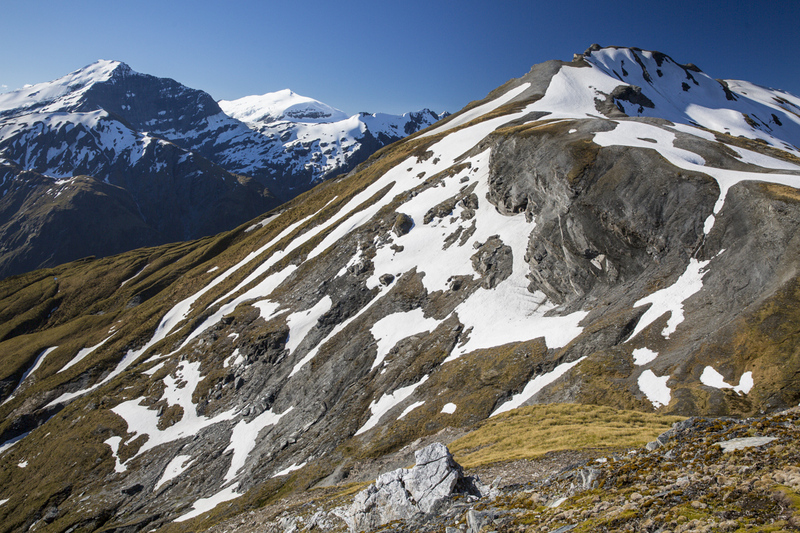 The processing of all the files from our week at the Albert Burn Saddle is a major undertaking. Christmas festivities have impacted somewhat on the process. The Time Lapses require quite a lot of discipline and even greater quantums of computer processing grunting etc. The plan is to eventually edit these and make a compilation with appropriate music and background sound etc. In the meantime I’ll gently upload a few of the individual sequences as an entree to give you a taste of whats to come. They are totally at random at this stage and have not been edited at all. The Vimeo blurb will give you an idea of what they are all about. There are many more to follow over the next few weeks. 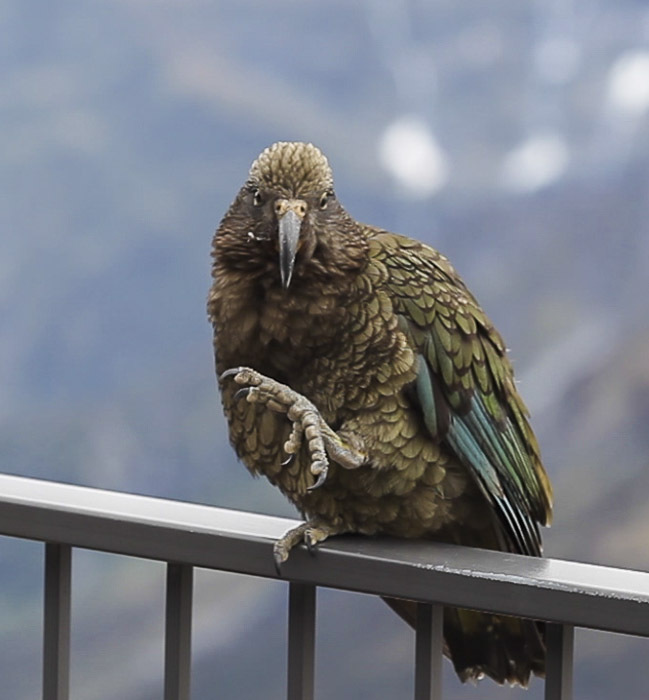 I’ll post some Kea videos shortly too. These initial video sequences are completely unedited and are pretty much warts & all. 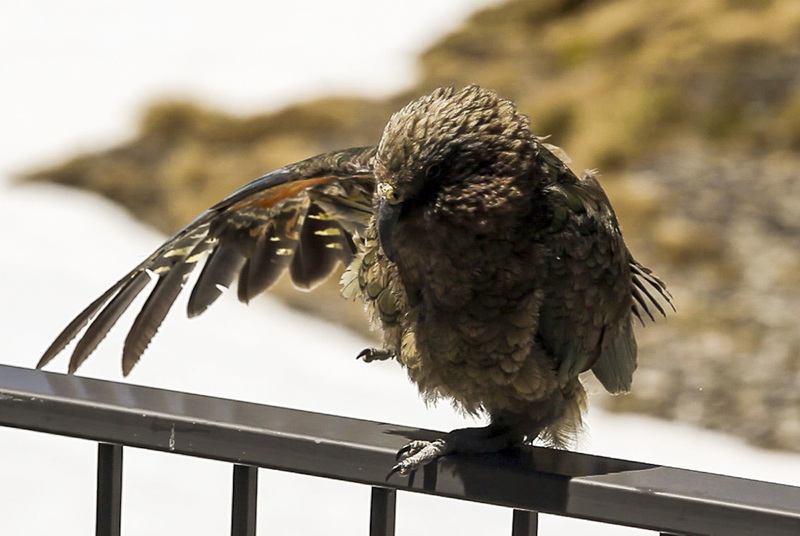 Here is a fascinating video of a Kea preening and scratching herself. This one unfortunately lacks a sound track however several others with sound tracks will follow shortly. 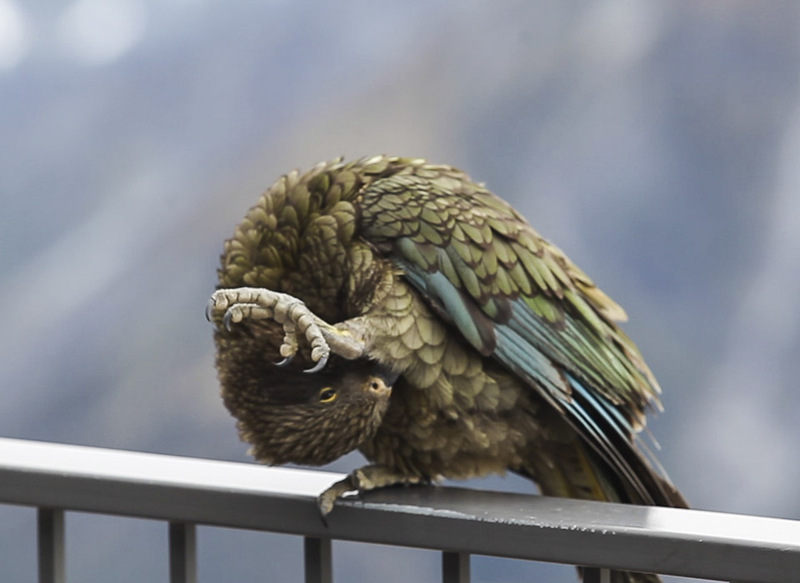 Click HERE to view the low res tablet friendly version of the preening, scratching & contortion video. 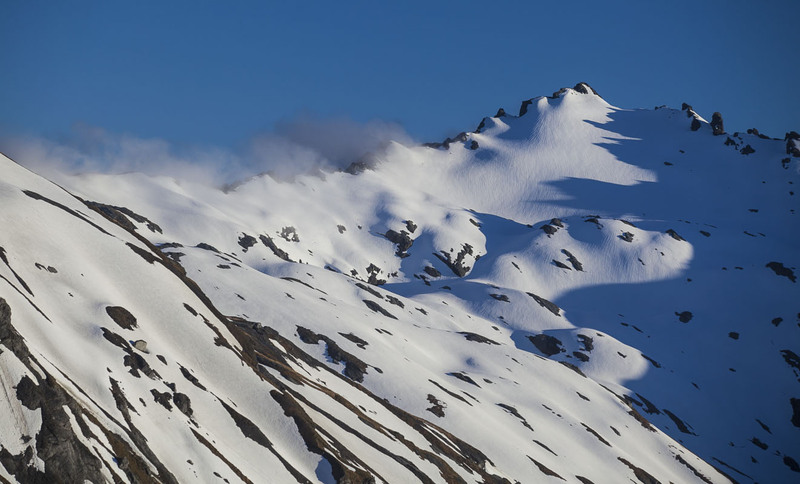 This timelapse video is of cloud swirling around the Kitchener Cirque on Mt Aspiring above the Aspiring flats. 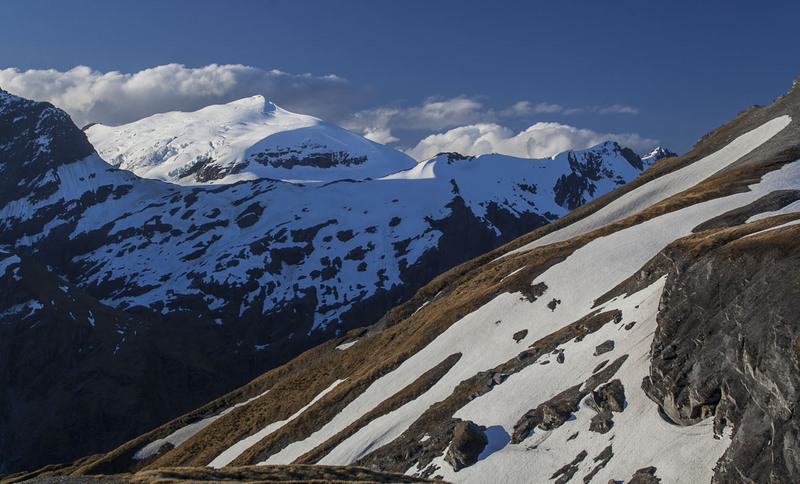 The distinctive Turnbull Thomson falls can be seen to the right of centre of the frame. For more information read the blurb and follow the links on the Vimeo site. Lots more to follow soon. It has been a dull bleak day here in the saddle with most of the views rendered monochromatic with just limited tonal range. The view to the east at dawn. 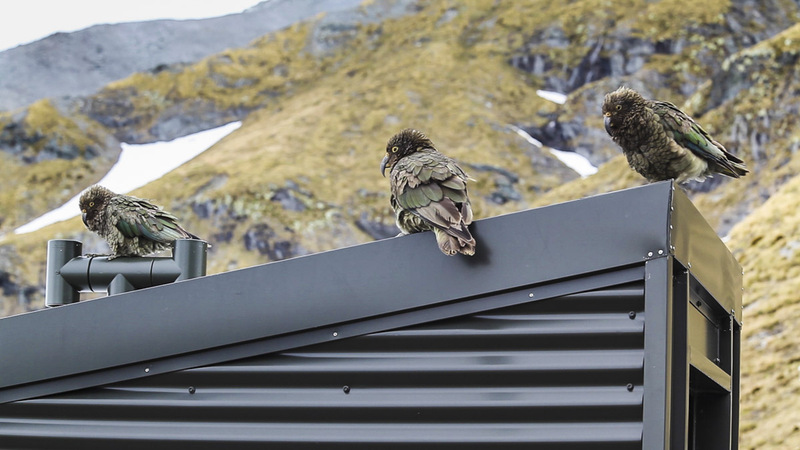 Our Kea friends weren’t impressed either … they briefly called in for ten minutes or so and without their usual fanfare snuck off to seek shelter under a dry rock overhang somewhere. I did attempt to capture a time lapse sequence of the changing doom & gloom but gave that away when I couldn’t keep the rain off the camera, lens & intervalometer. Umbrella was of nil use in winds gusting over 100 kph. 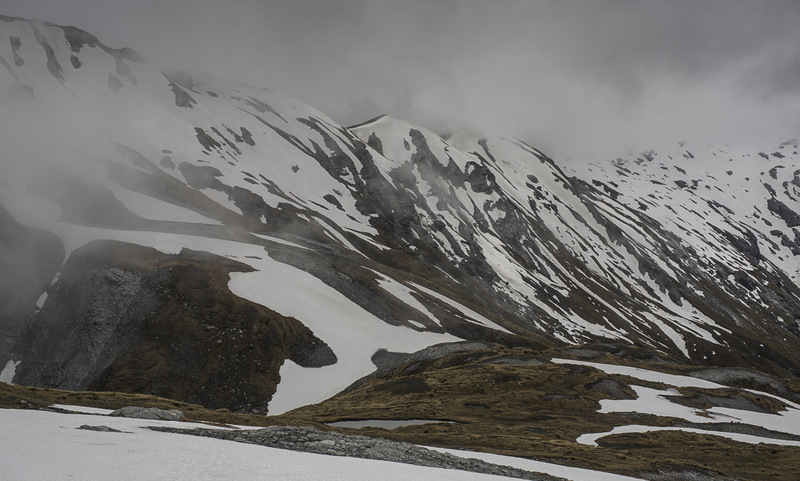 The heavy rain has caused spectacular snow melt and there are now waterfalls all over the place that weren’t present earlier in the week. The forecast was for gale force Northerlies all day but the wind has been coming from all directions. Robyn has been busy with her alpine quilting project and I still haven’t had a chance to immerse myself in Monbiot’s “Feral” and Phillip Temple’s Mi STORY which I had been planning to read whilst here too. Here are a few comments from Robyn who has been busy working on her Alpine Quilt project for most of the day. Definitely confined to barracks today. The only change in the weather has been which way the wind was blowing – north or south with a few blasts in between. The Chalet was certainly a snug place to be and a delicious asparagus soup was the perfect lunch. There hasn’t been even a glimpse of inspiring Aspiring today and productivity seems to have slowed as a result. Still it has been a good exercise and hopefully more will come of it. 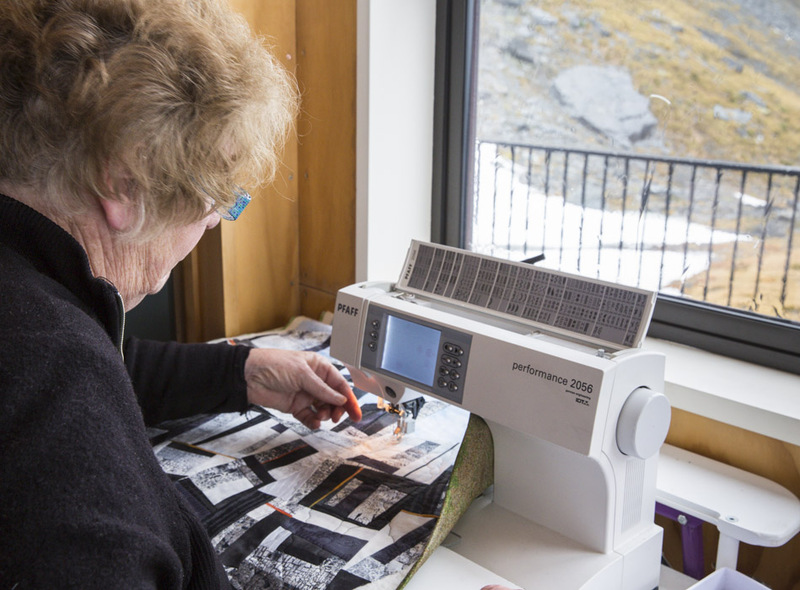 Robyn at work on her Alpine Quilt. 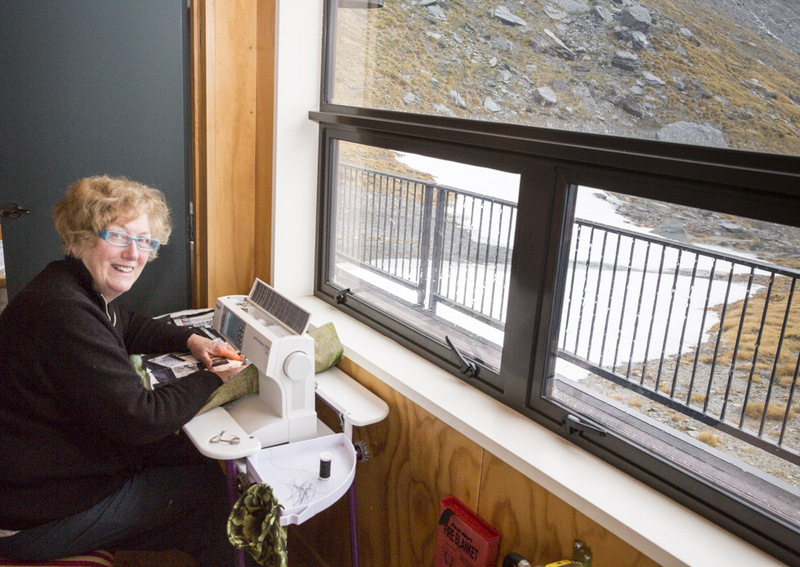 The Albert Burn Saddle is an unusual place for a high tech sewing machine. Unfortunately this will be our last post from our wonderful Eyrie in the Albert Burn Saddle. Tomorrow we return to civilisation. 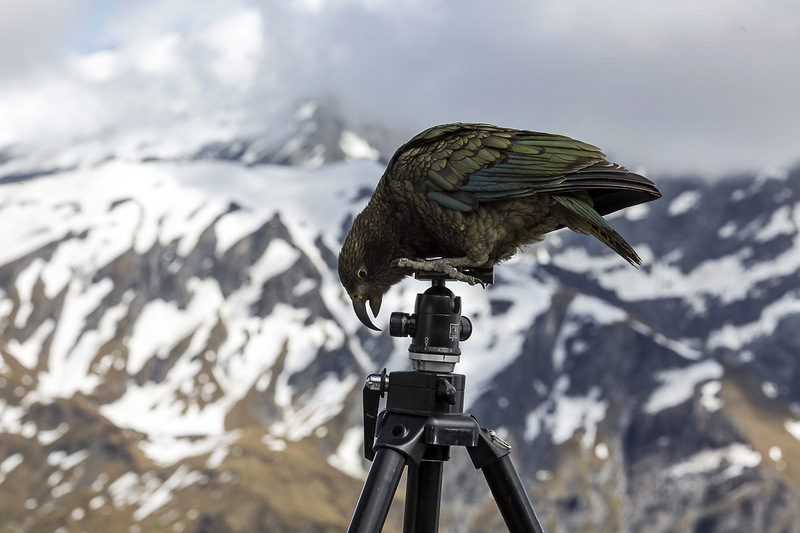 I will continue posting links to some of my completed work from here such as Time Lapse Videos & Videos of the Kea Antics etc over the next few weeks. We have really enjoyed our time here in this magic and precious wilderness environment and bringing the blog to you. The Rainbow Connection – coincidence or not? 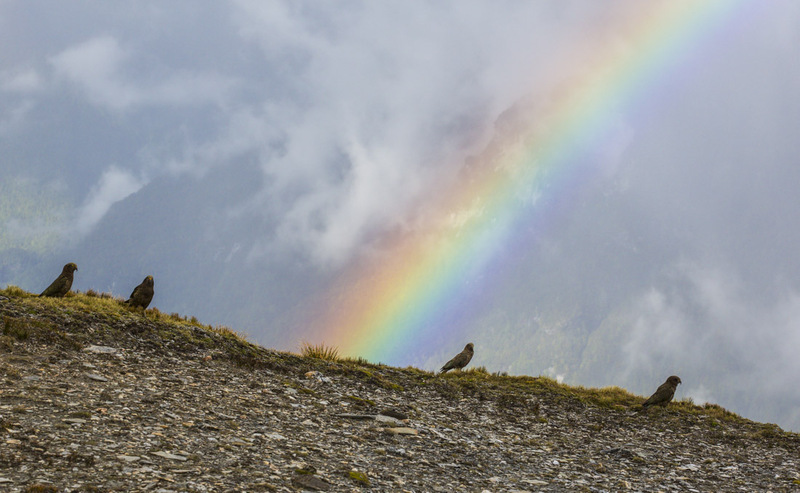 Rainbow & five Keas above the East Matukituki valley this morning. Coincidentally the Rainbow valley is directly behind the rainbow. Rainbows usually indicate that there is rain nearby. I suspected from the forecast that there would be. Early this morning we had confirmation. The large spectacular rainbow to our South West lingered for nearly an hour. Everything in nature is connected. Our rainbow this morning was located exactly above the Rainbow Valley behind the south ridge of Mt Sisyphus on the other side of the Matukituki valley. Pure coincidence? The Rainbow valley flows into the Kitchener valley & stream which joins the East Matukituki at Junction Flat that I have written about in a previous post – in relation to Paul Powell’s Mountain Tree poem. Our rainbow was special in another way. 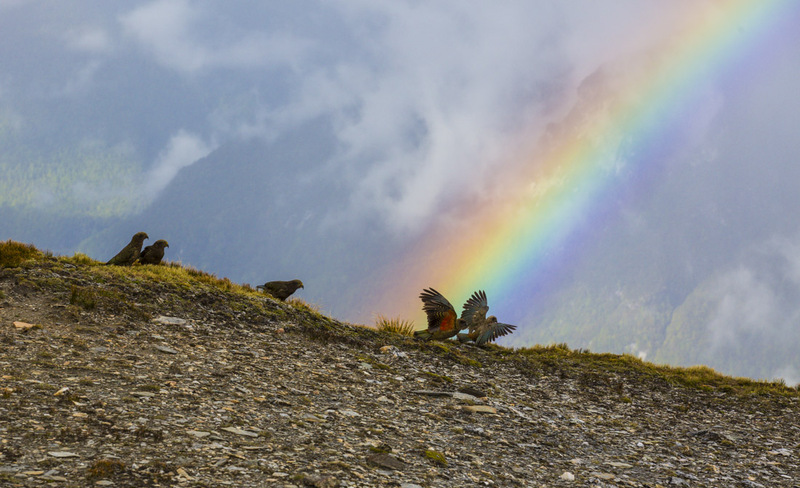 Initially there were five Keas at the base of the rainbow. I’m sure they wouldn’t know about pots of gold & stuff like that but there they were at the holy grail. After a bit of an altercation one of the birds eventually got chased away & then there were just four. 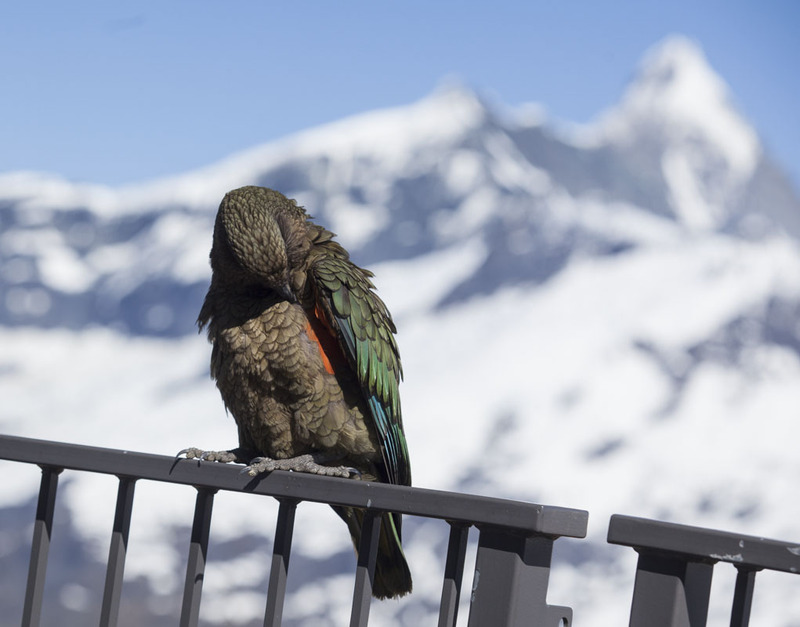 Just four Keas & the rainbow after a slight altercation which saw one of the original Keas chased away – poor Kea. Much like the old ditty I remember from my distant childhood that starts with ten in the bed & then the little one said “roll over”, so they all rolled over & one fell out, then there were just nine in the bed & the little one said ….. etc etc. 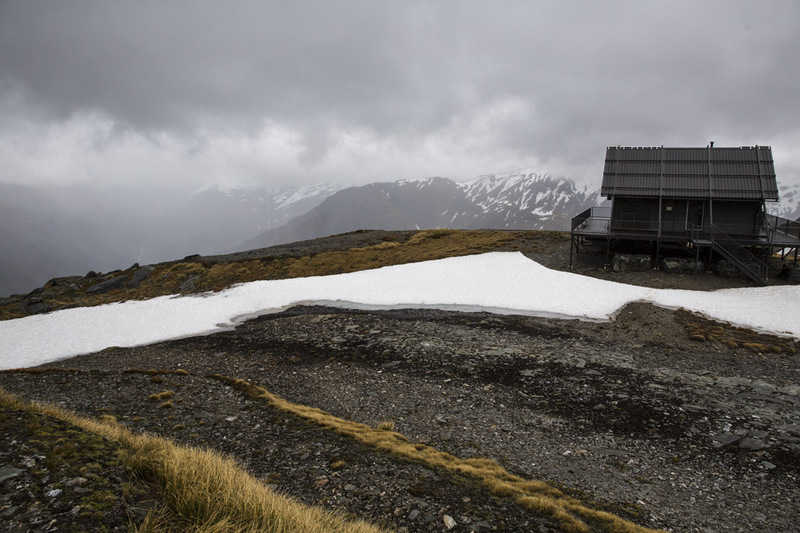 Anyway in the many mountain huts that I’ve had the good fortune to stay in, rain days usually signify copious amounts of uninterrupted reading. However for this one today that prospect just wasn’t to be. I have been itching to read one of my favourite writer and commentators about the natural world and its challenges, George Monbiot’s, latest book titled “Feral” which I have brought up here with me in anticipation of a rainy day but that’s going to have to wait for yet another (rainy) day. Outside the chalet the day has been rather dismal but there were numerous opportunities for yet more frivolous interactions with our comical avian companions & to create some more time lapse sequences of the ever changing interactions of the light & clouds and the surrounding mountains and the rapidly disappearing snow. 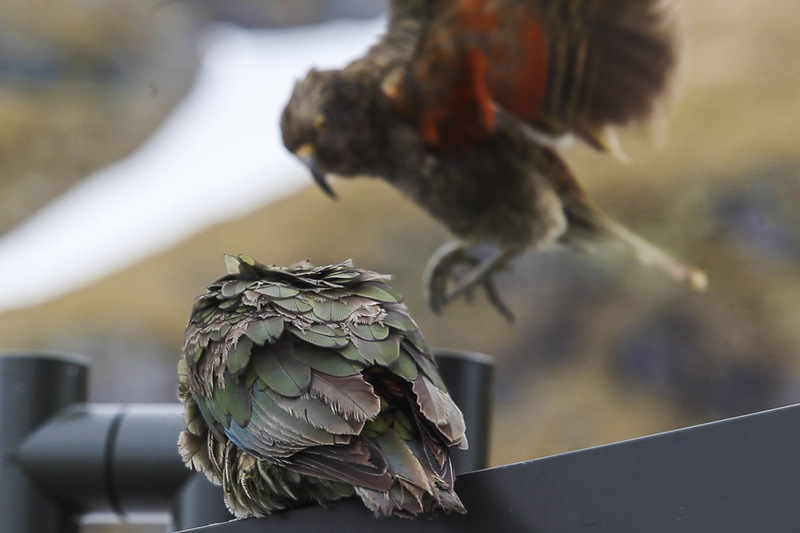 Also I was at last able to extract some of the humorous still images of the Kea antics from the videos that I had shot over the last few days that I have been telling you about. So without further ado – I will now present some of those to you for your enjoyment – at the start of the weekend. They have been very randomly and arbitrarily selected. First up is our Live Parrot with some shots from his silly walks sketch that I described on tuesday. But then there were a few disagreements & scrambling for lofty positions. A variation of the silly walks routine is a nifty side step. To the left and to the right. The side step has been practised and perfected on the long drop roof. 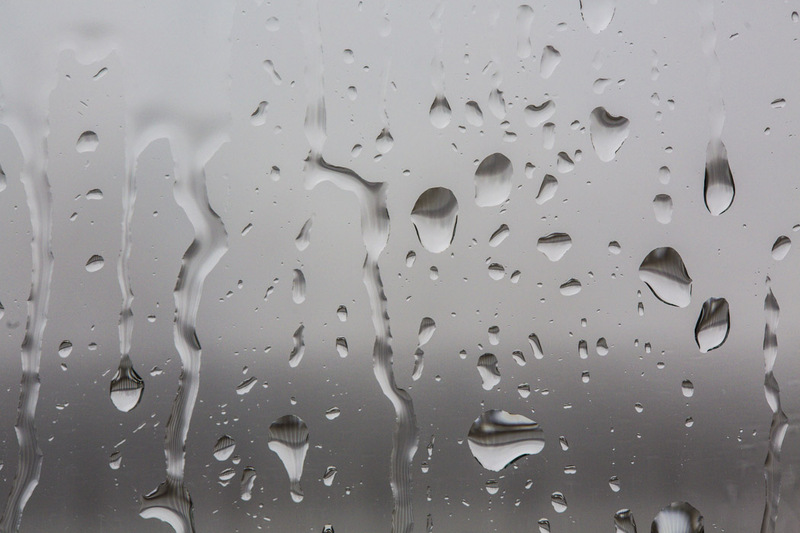 The rain is now setting in here tonight. We are expecting upwards of 100 mm in the next 24 hours or so. The wind chill outside is about minus 10C. Robyn has been beavering away at her quilt design for most of the day and making good progress with it . She will hopefully be able to tell you something about that herself tomorrow. Have a beaut weekend wherever you are. 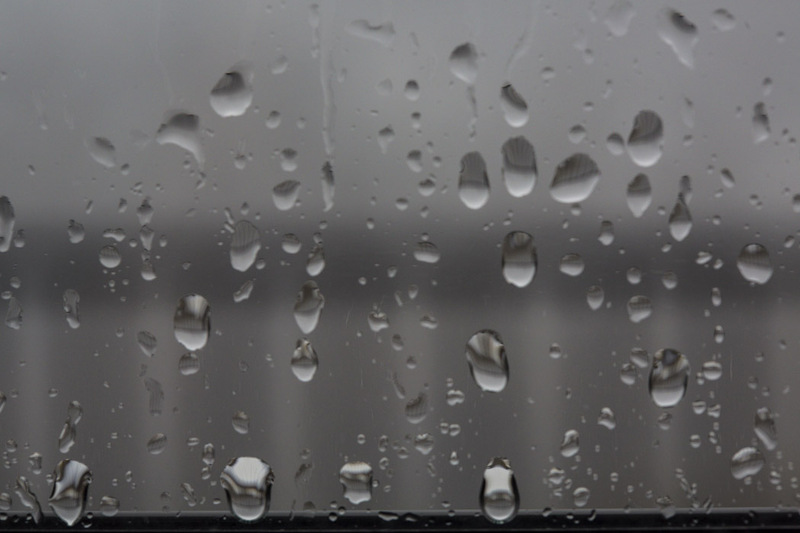 “Moody Gloom” best described the view and atmosphere out of our large panoramic windows at dawn today. The cloud ceiling was only a few metres above us. 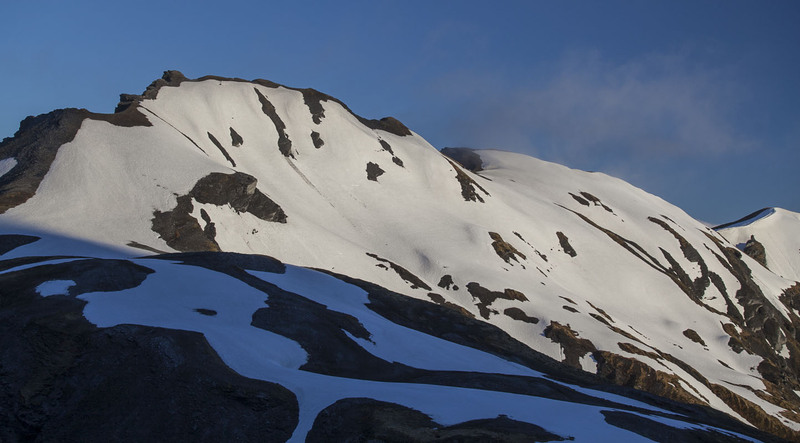 Some of the patterns of snow in the head basin of the Albert Burn in the sombre light were quite graphic and fascinating. 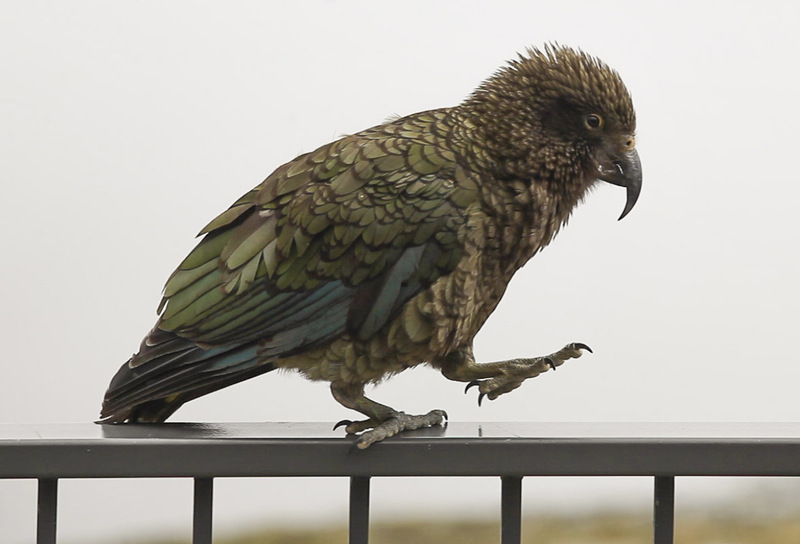 Very distinctive chortling noises heralded the arrival of a vocal group of six Keas who grouped around the base of the weather station tower and set about systematically searching for and excavating plant roots of what appeared to be various Celmisias. 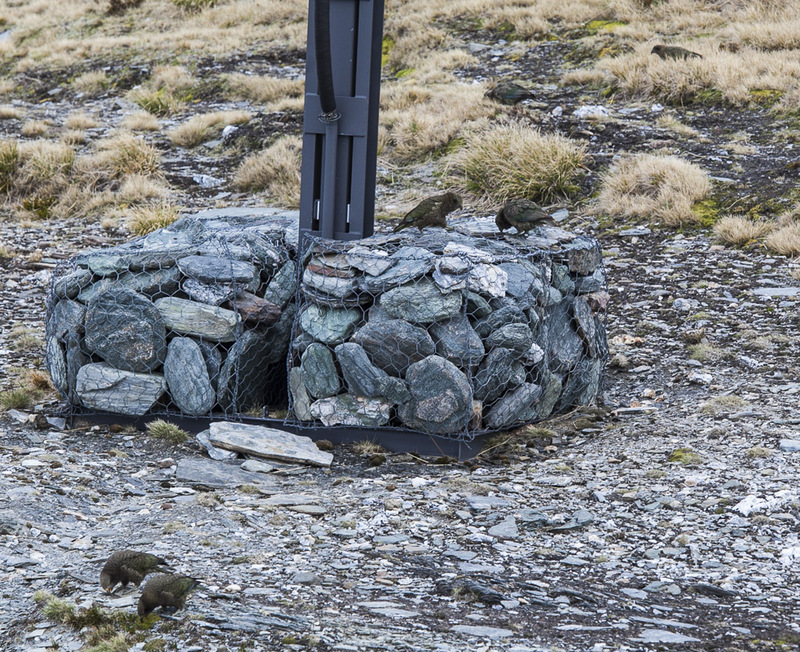 Three pairs of Keas at the base of the met station tower systematically searching for roots. The pair on the rock basket are temporarily distracted. They didn’t stay long before flying off to alight together further down the valley. 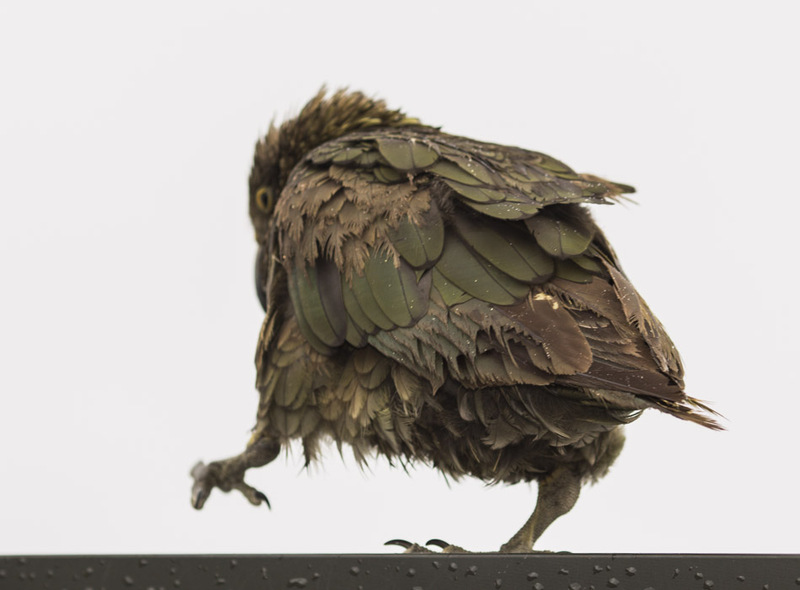 I had a willing Kea model for some video filming a short time later as she performed all sorts of contortions and odd angles of legs & beaks and wings etc while carrying out a thorough all over preening job. Hopefully I can show you some stills from the sequences tomorrow. At the same time on another camera & tripod I was able to set up and capture several time lapse sequences of the forever changing cloud patterns coming and going in both the Matukituki and the Albert Burn valleys. It was difficult to choose the most dramatic angle.. once again I was spoilt for choice. After a quick late lunch I decided to climb part of the way up on to Dragonfly peak for a fair dollop of cardiovascular exercise. 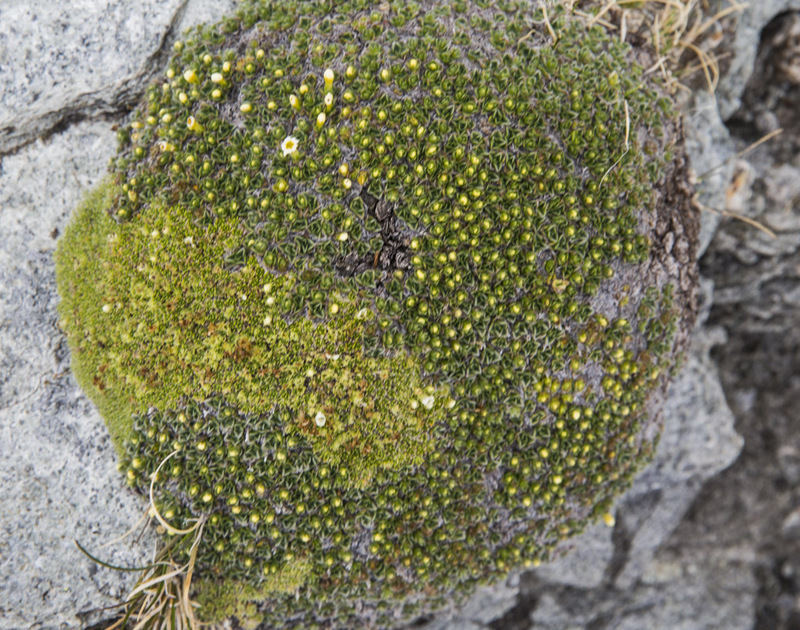 There were some exquisite cushion plants en route. And squillions of grass hoppers .. some of them spectacularly fat. If we weren’t so well fed here I’d be tempted to try eating some. Moderately folded foliated schist outcrop on the leading spur on Dragonfly peak. 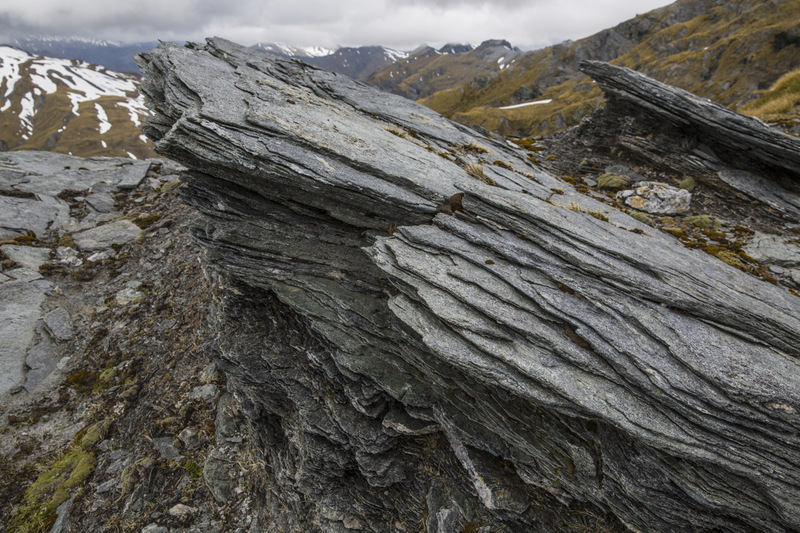 Schist is a metamorphic rock formed from marine sediments. 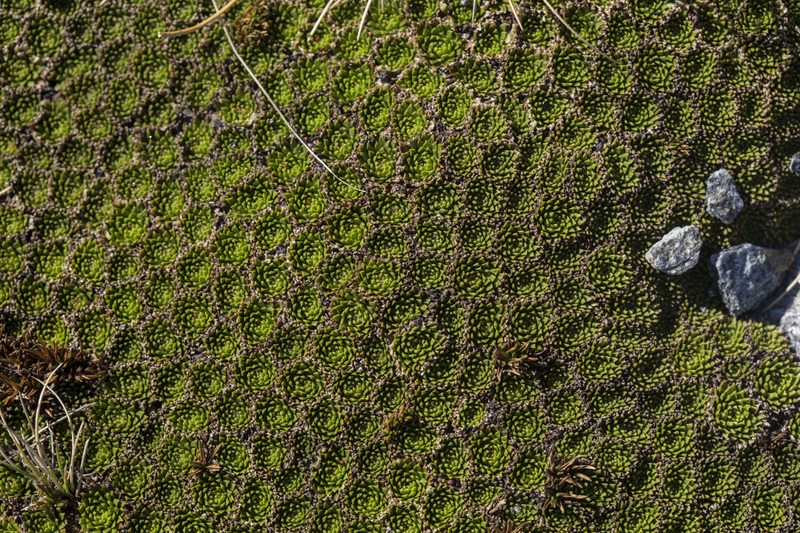 The common name of Raoulia is vegetable sheep… for obvious reasons. Also highly apparent were large quantities of hare pellet droppings and several Celmisias that had obviously been drastically chewed by the hares. We haven’t seen any hares here yet. That doesn’t meant they aren’t about though. 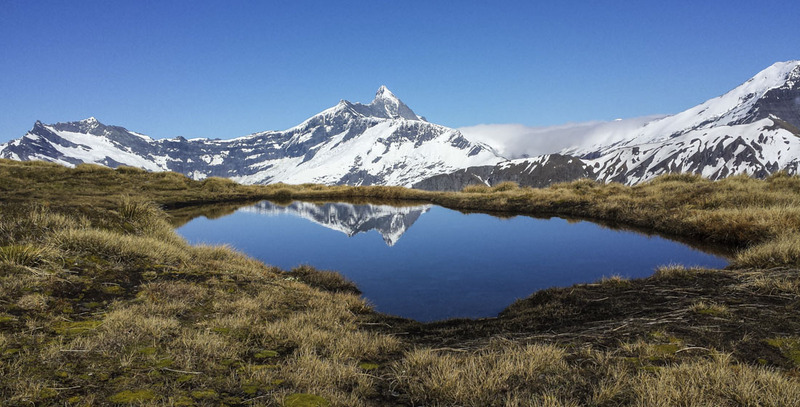 We haven’t seen Mt Aspiring at all today either and we know its still there. Robyn also took a walk this afternoon. We will finish tonight with her experience. Living in the clouds for much of the day made it a good one for my stitching project. 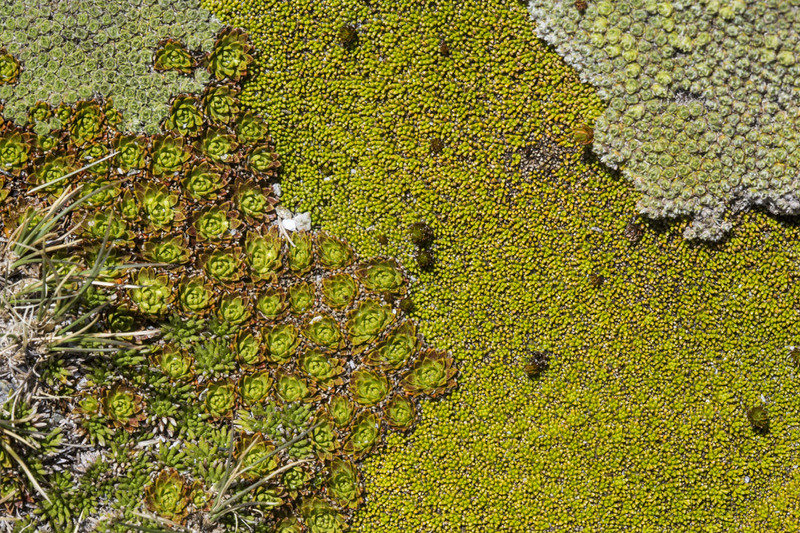 Took a shortwalk to the waterfalls at the foot of Dragonfly late in the afternoon – a lovely area with islands of schist/tussocks/cushion plants in a sea of snow. 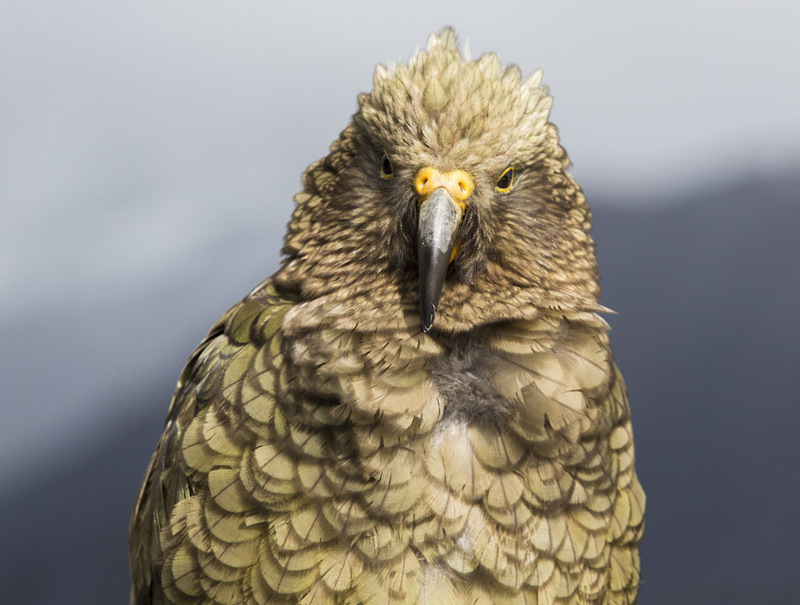 I’d just clambered onto one island when a movement caught my eye and there, right beside me, was one of the kea gang. 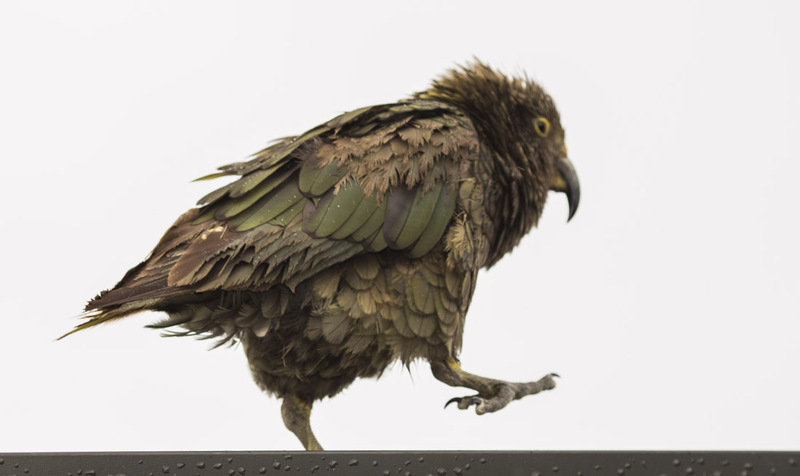 What is a gang of keas called – it would have to be a cacophony wouldn’t it? We had a conversation and cruised away. A bit later one flew right by showing off his gorgeous orange underwings. They really are something special. I made a few more short astro timelapse sequences during the night and by first light the sky had clouded over and all of the snowy faces to the west had a distinctive red tinge. Dramatic Weather Change – Red Sky over Tititea at 5.50 this morning. 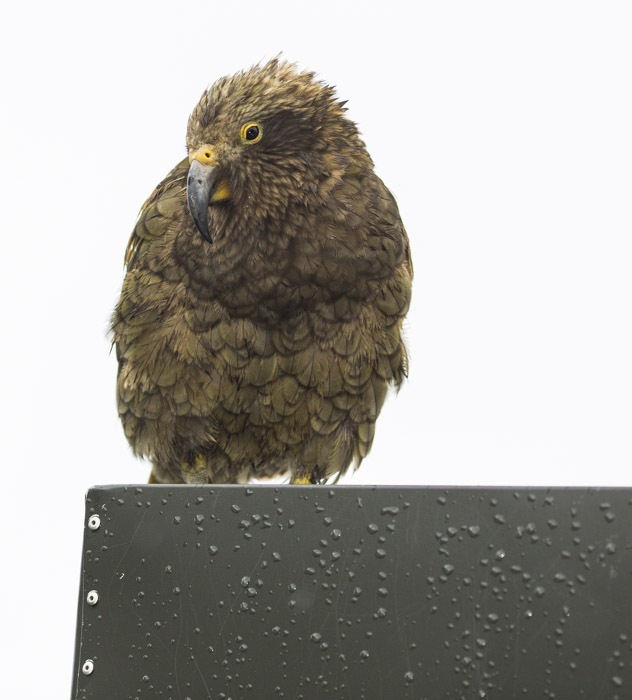 Around 40mm of rain is forecast in the next 36 hours or so which the Keas will wellome because one of their favoured water sources, some puddles in a rim around the top of the sealed plastic water tanks on the front deck, have now dried up completely. Yesterday I placed a litre or so of water there and within a few minutes two birds had turned up to drink from it. Although the light hasn’t been particularly conducive for photography today there has still been plenty to do.Its a never ending job keeping all the various batteries charged and the CF cards properly formatted & lenses & filters cleaned ad infinitum. Thats the real tedious part but it is the most crucial. Then there is all of the reviewing editing and cataloguing of the images and backing up and archiving the files where necessary. So far I have accumulated nearly 600Gb of files in the 6 days we have been here. That includes the HD movie files from yesterday and the all night night sky astro session which involved a HD image file every 9 seconds for the entire night. 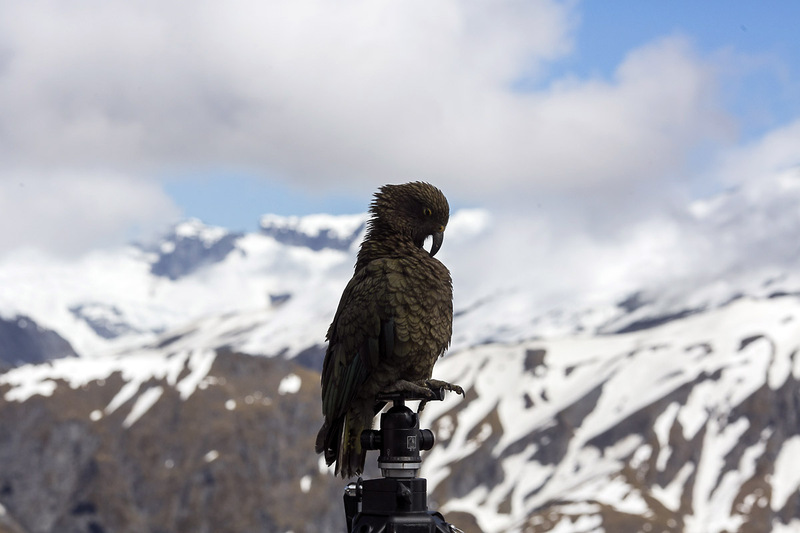 I have been fine tuning my systems & procedures for making HD videos of the engrossing Kea behaviours with SLR Magic Lantern programme and a high quality external stereo microphone. There are so many things that need to be coordinated in the process to be able to pull it all off that its not funny. I guess that’s why most film productions travel around in grand entourages with large teams of technowizzes. 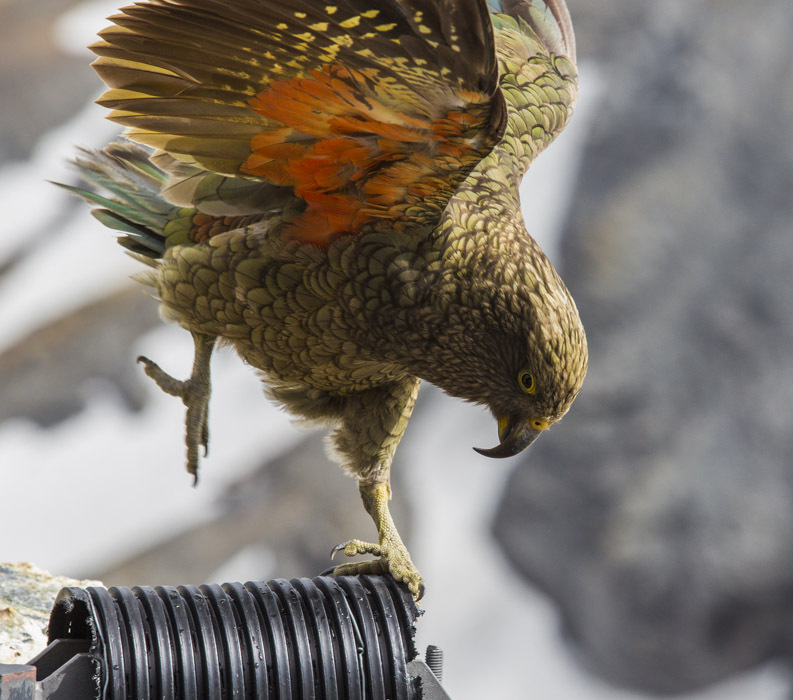 This afternoon I conducted an experiment and played back my recorded calls of the Kea back to them. It really got them animated. However they wouldn’t stay still in the same spot for long enough to let me film them. Never mind. 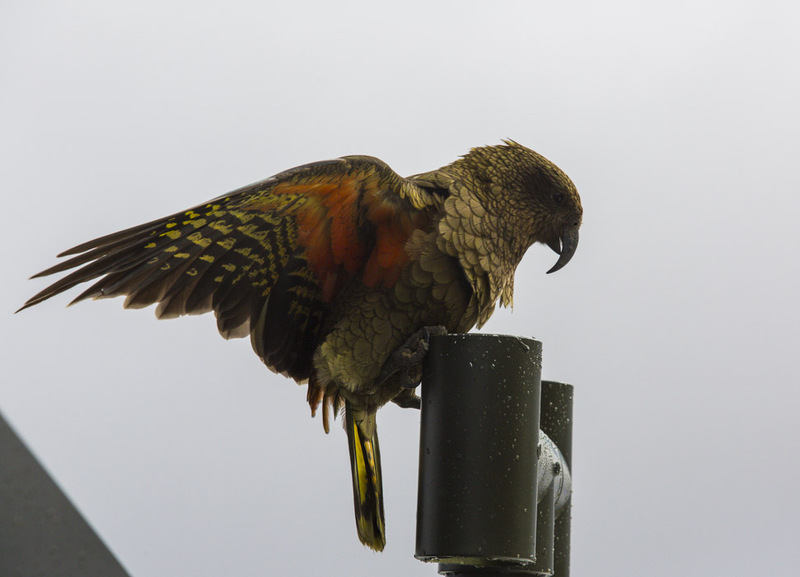 Late this afternoon we had a Kea Hoolie when 13 birds arrived to cause mayhem in the camp. For a while the centre of focus was the long drop dunnie roof and I managed to get some great footage of the hilarious interactions and nutty behaviour of these endearing clowns. Unfortunately all of those images are part of the video sequence files and not able to be incorporated into the blog posting tonight easily, so some other photos will have to suffice for tonight. 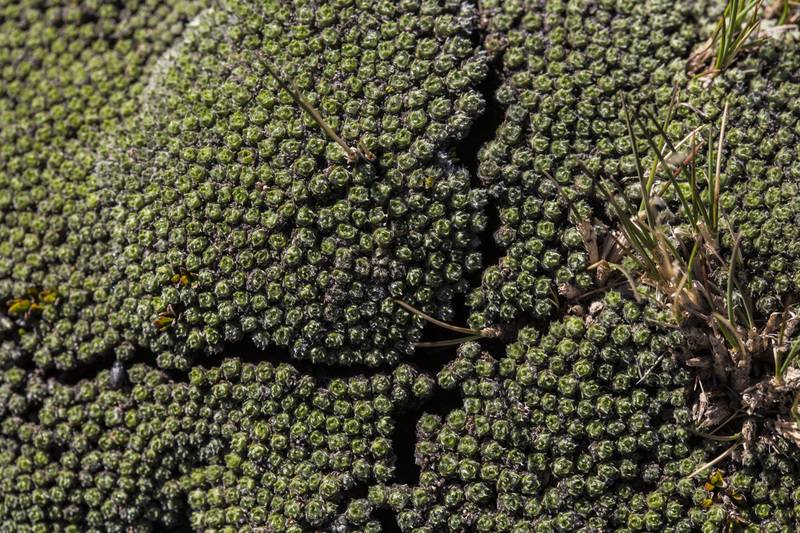 There are some scrumptious, beautifully delicate cushion plant communities quite close to the chalet. I find the orderliness of them mind boggling. Here is part of another one. Yet another one of a distinctive Raoulia community. There is a little beetle included in this one. I must have spooked him and made him want to hide in the crack because he seemed to be enjoying the late afternoon sun before I disturbed him. Sorry Beetle. The Southern facing wall of the Chalet last evening. The spacious deck is absolutely perfect for photography. 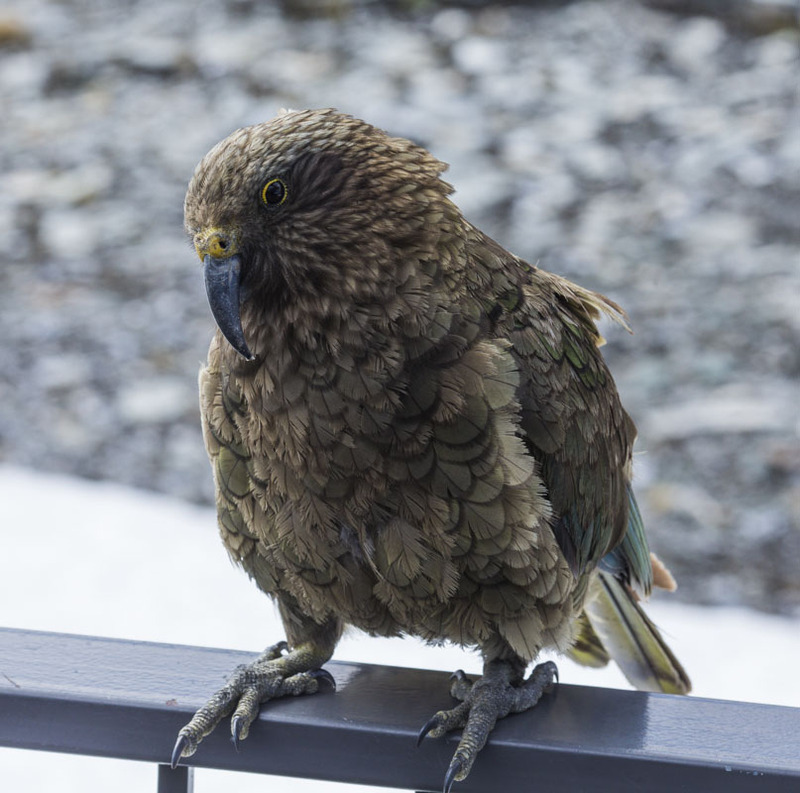 Robyn would like to add a few comments about the spectacular Kea visitation event late this afternoon. A change in the weather brought steely grey skies and not good photographing light. Intermittent spots of rain during the afternoon were enough to cause Gilbert to disconnect the pump and bring it in, specially with the promise of heavy rain in the night. A cold wind got up and outside was generally unappealing until a few raucous screeches took us outside. 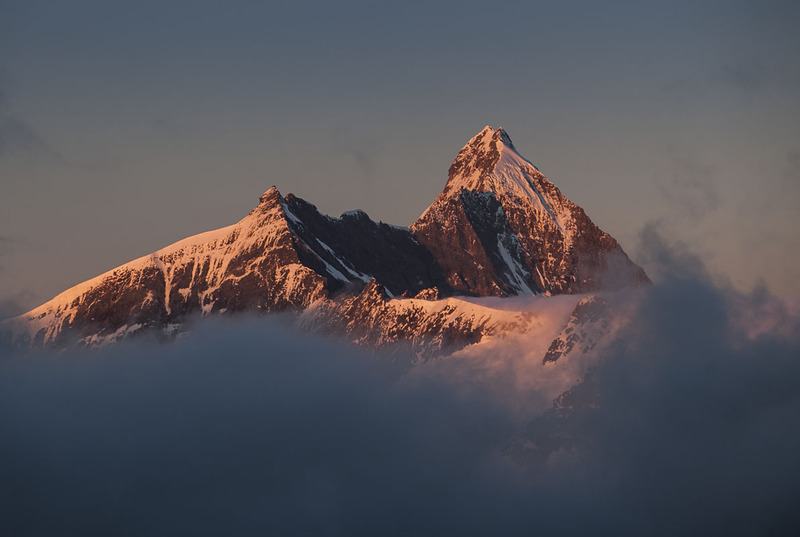 Our usual crew had arrived, but had gathered the whole team – somewhere between 11 and 14 – it was rather hard to count as they went from scrapping on the peak of the roof as they wrestled with the wind or sitting on the ground more or less sheltered. Why they would all be out in such a wind was hard to fathom as they seemed to have real issues with it, unlike the black back gulls which rode the waves serenely. 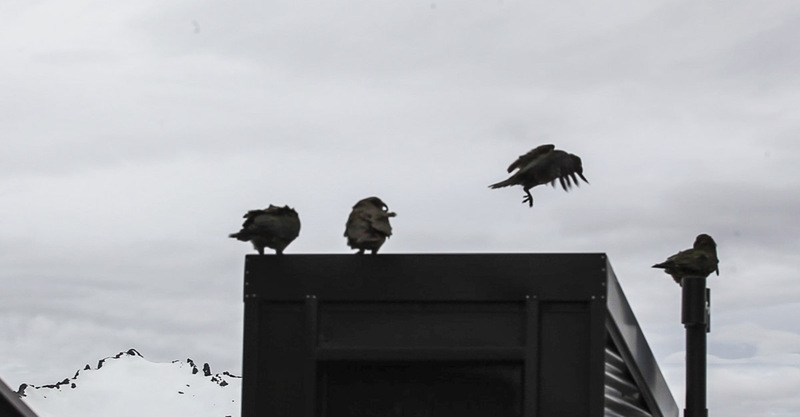 Seeing all the keas flying together was amazing as they seem so lead footed and somewhat clumsy on the ground. Another day, another highlight! And tonight’s lamb curry is smelling delicious. The last 24 hours have been cloudless here which has meant that the daytime time lapse aspirations have been put on hold. 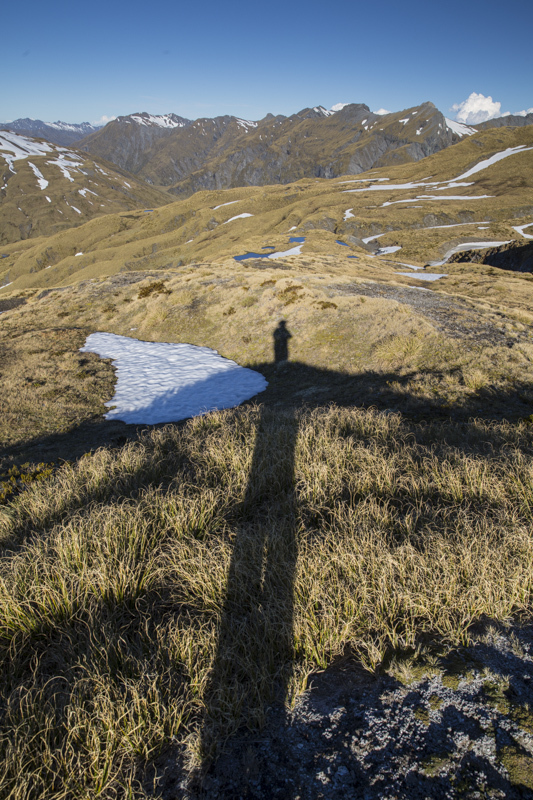 Timelapses of landscapes without clouds moving by tend to be quite banal I have found. However the night sky here has been incredible and clouds are not preferred for photographing those. Consequently I was up for most of the night and should have a fairly unique time lapse video of the Albert Burn Night Sky compressed from around 8 hours real time in to to a 2-3 minute HD film. Before the moon rose at 2.07 am the stars were so bright that I could clearly identify all of the surrounding peaks & see lots of detail around the saddle. 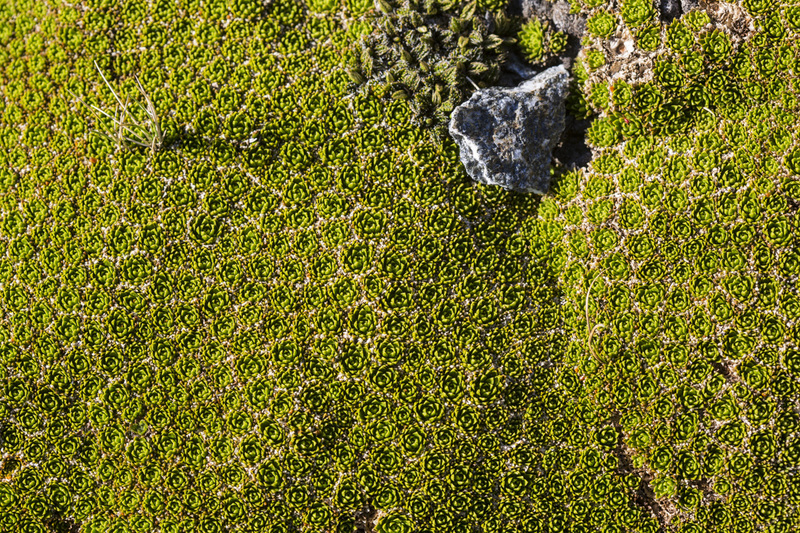 Here is just one frame of a minuscule section of sky which includes a rock near the summit of Dragonfly at the bottom right side for scale reference. 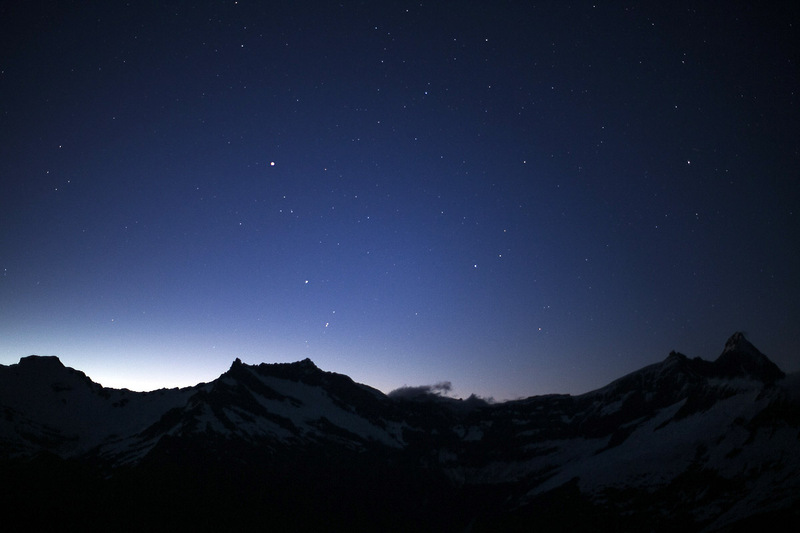 There are quite a few stars there … hard to imagine how God manages to keep track of them all. 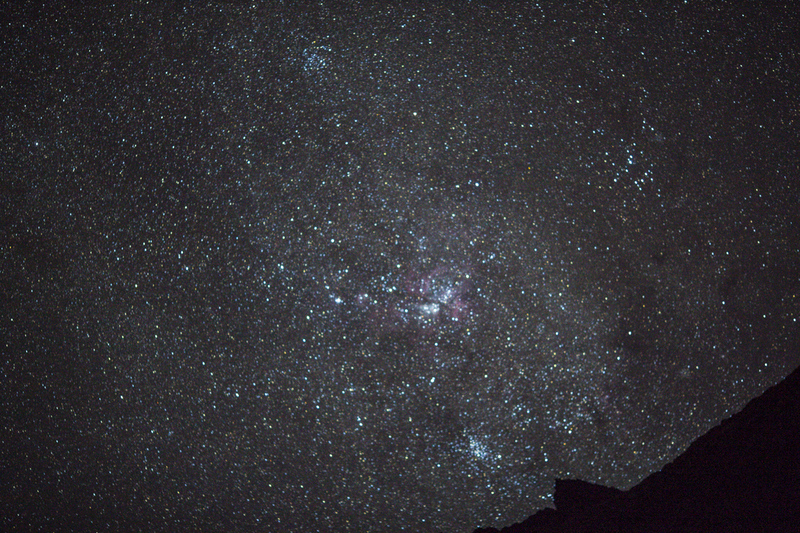 Minuscule fraction of the night sky to the south of the saddle taken on standard camera lens. No telescope etc. 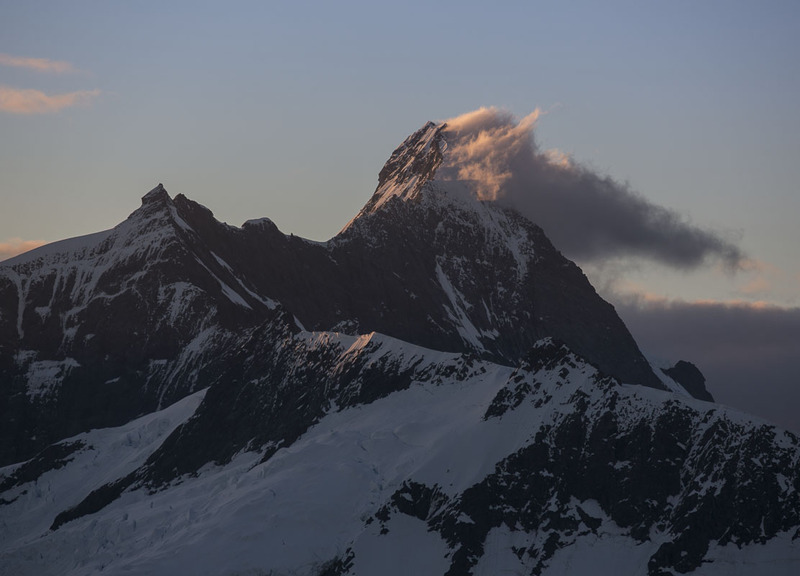 No sooner had I brought my gear inside at 4.30am than the sun was starting to illuminate the peaks to the west and south of us in spectacular dramatic style. Every sunrise here is unique. 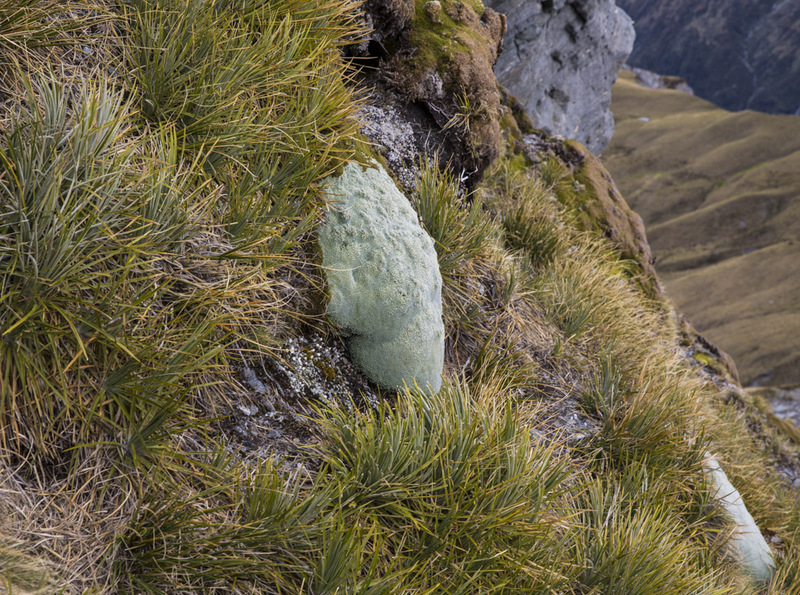 One stand out view for me was Mt Tutoko – the highest peak in Fiordland – and a formidable monolith which I had managed to climb when I was more agile over 40 years ago. Yesterday afternoon I took a stroll into the upper Albert Burn basin. 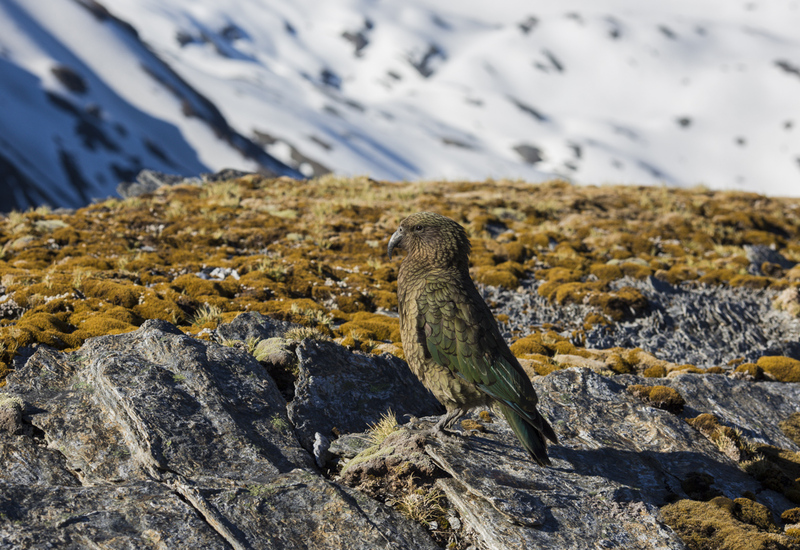 I was followed most of the way by one of our Kea friends who had another go at stripping my Leki Poles while I wasn’t watching. This afternoon we managed to make a short video sequence of the silly walks live parrot strutting the railing with accompanying sound effects (in stereo). So we now have our own genuine “Live Parrot Sketch”. Yesterday’s highlight had to be sitting outside at the table with our delicious stir fry at about 9 o’clock watching the sun go down, firstly on the peaks here and then on Cook and Tasman. There was not a breath of wind, not a sound. It was sheer magic topped off by a kea family fly past. 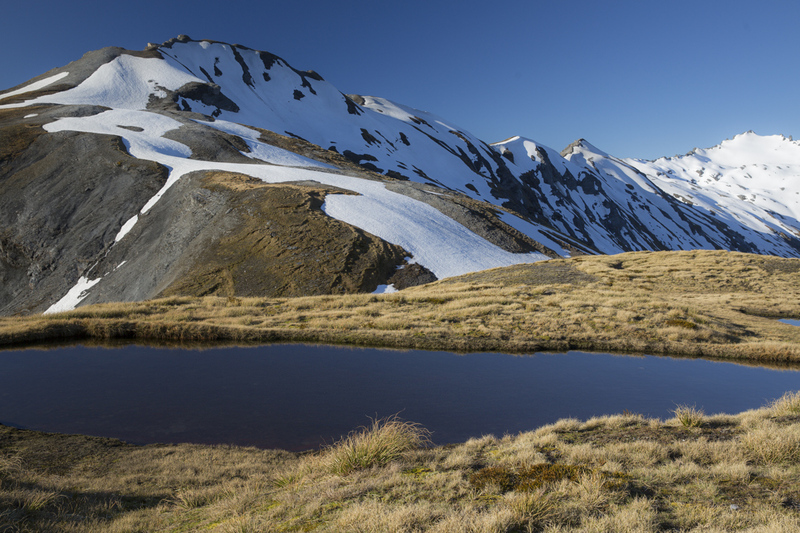 We have had another stunning night & day in the heart of Otago Alps. We have certainly lucked into one of the most stable weather systems to reach us this spring. 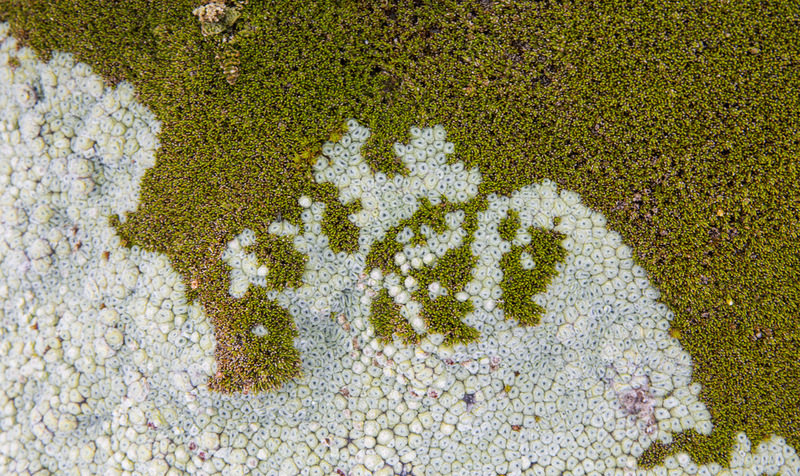 The very low humidity currently has meant that there have been very few clouds in the last 24 hours which tends to make photos of the landscapes here not quite so interesting so I have been focussing on a few other things until a few clouds return. 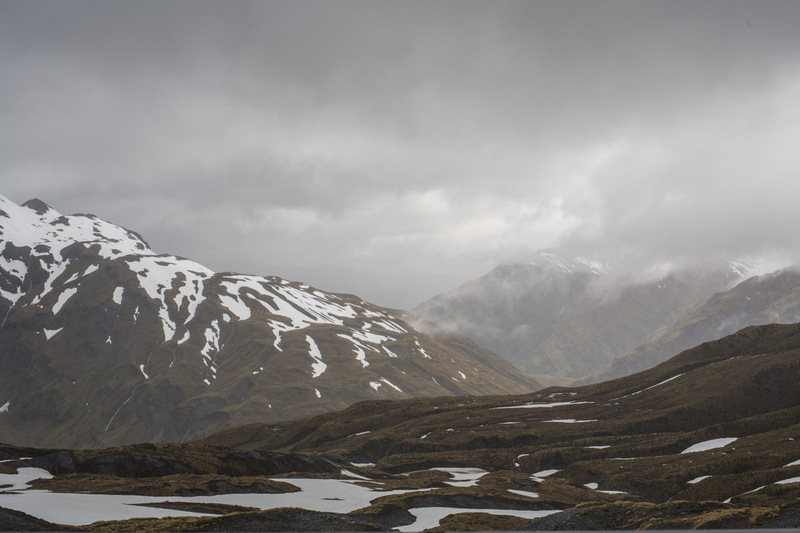 View across the Albert Burn Saddle this morning. 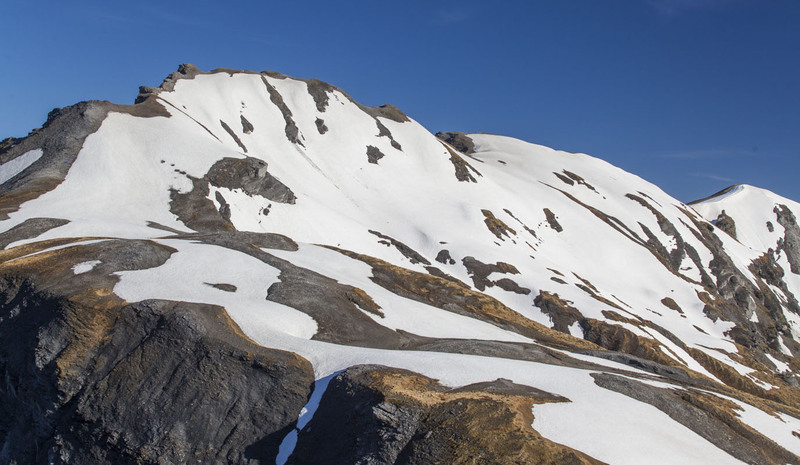 The warmer temperatures have resulted in spectacular snow melt since we arrived here making for some interesting patterns as the underlying rock & terrain is exposed. There was a forecast for a large meteor shower in the region of the constellation Gemini at around 2am this morning. I was prepared to photograph it but unfortunately that forecast didn’t come to pass. For me anyway. The Geminid meteor shower sequence is an annual occurrence in mid December and can be seen from nearly everywhere on the planet and in space too no doubt. Most meteor showers are the result of cometary debris, but the Geminids are linked to the unusual asteroid 3200 Phaethon – a rocky object with a comet-like orbit, which suggests it may have a cometary origin. We still have a small decaying (declining) moon which lightens up the sky and landscape tomorrow morning the moon rises at 2.14 am so our best chances of seeing the showers should they decide to enthral us will be prior to that. 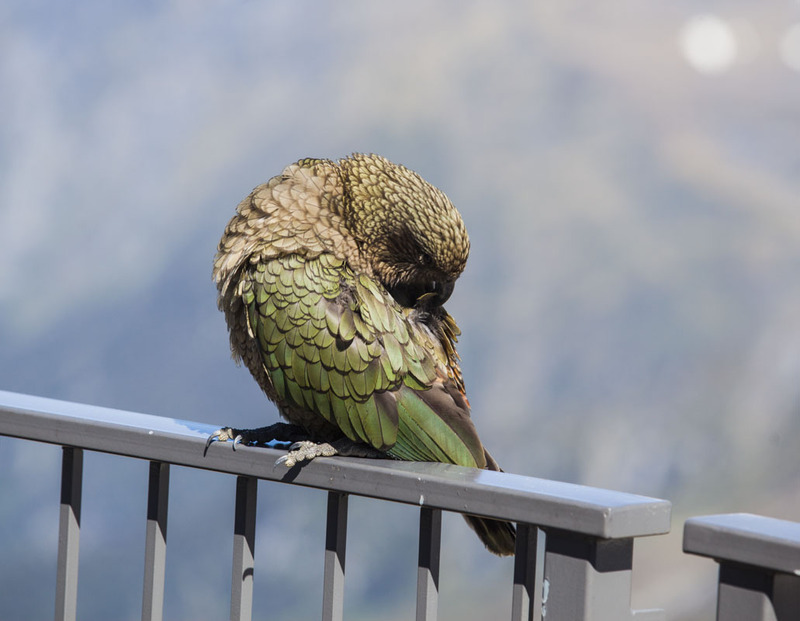 Kea preening herself this morning. 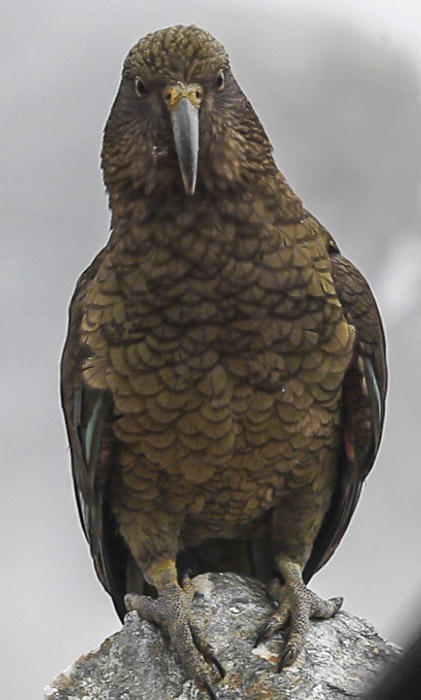 Mercifully the many raucous Kea visitations are during daylight hours and they seem to be part of the furniture here. 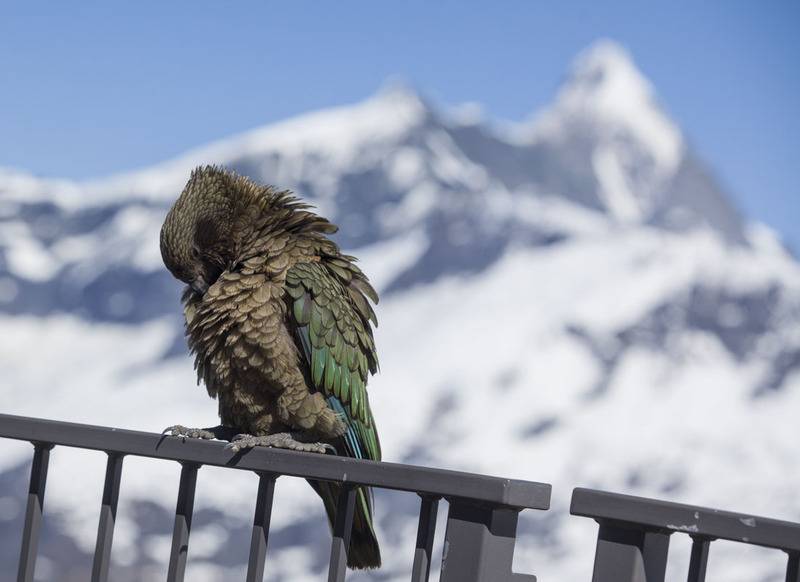 They are certainly not self conscious and seem quite happy to preen and tidy themselves seemingly oblivious to our presence. And a good tidy up on the other side. The biodiversity and vibrance of the plant and insect life here is spectacular. Exquisite herb and cushion fields abound right up to the chalet. It seems that many of the plants are poised to commence flowering any day now having only recently emerged from a complete blanket of snow & sub zero temperatures for the last 6 months. 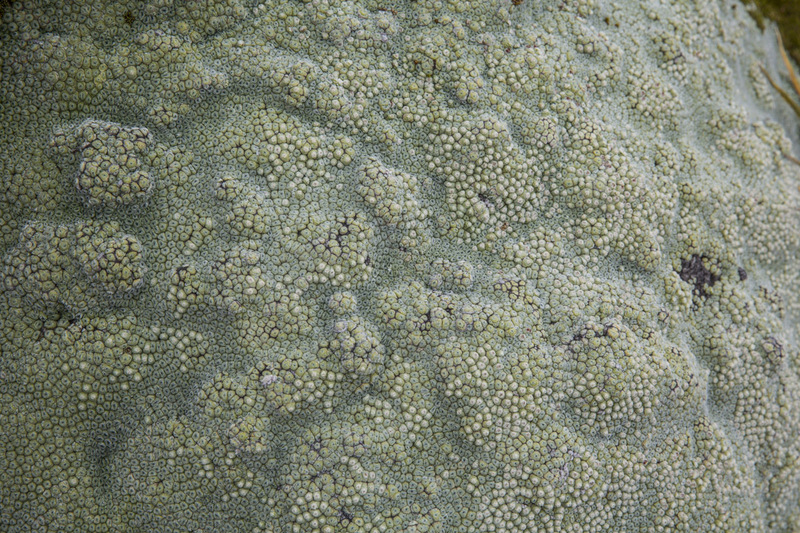 Raoulia hectori about to burst into flower. The geology here on the saddle is fascinating also. 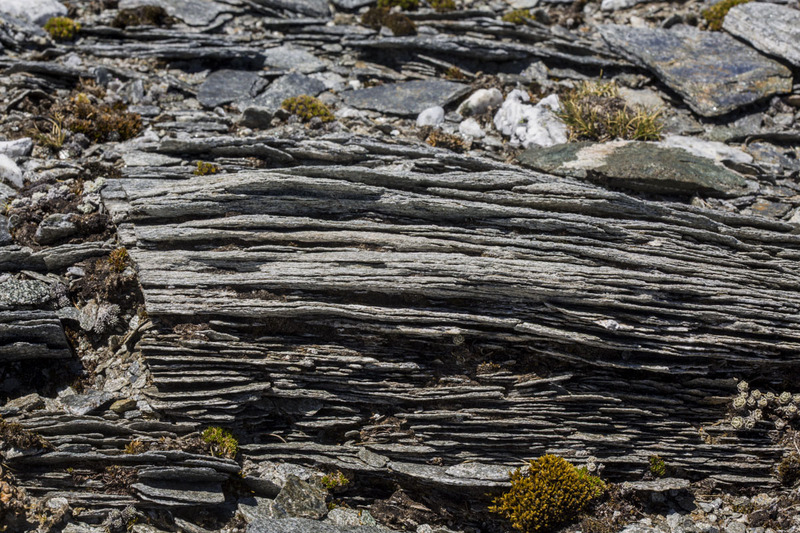 We have huge bands of folded schist which formed from submarine sediments at least 100 million years ago. We are right at the boundary between the Pacific and the Austro / Indian tectonic plates which have forced the layers up from the seabed to where we are now in the last 5 million years or so. 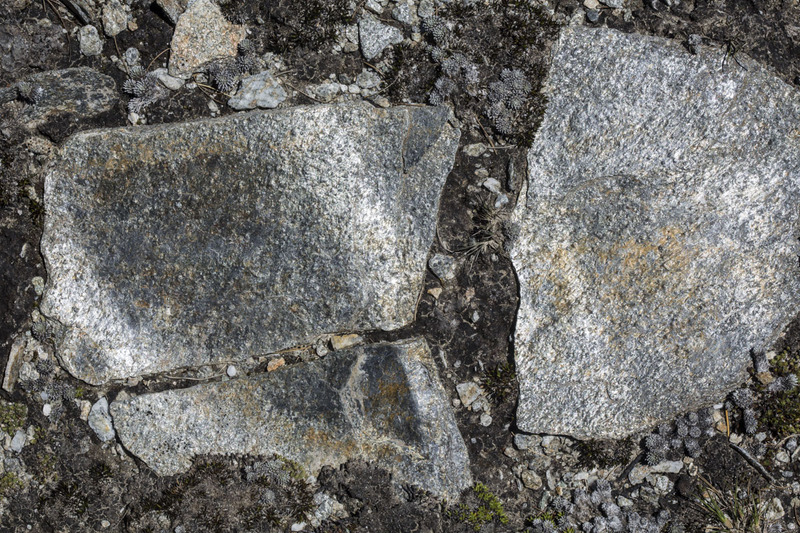 Fragments of Schist that were recently conjoined and likely fractured through ice formation and frost lift. Internet curfew is fast approaching again so thats about it from me for today. We will finish with a couple of photos that Brook took yesterday on his smart phone. We have been blessed with provident weather since arriving here and the forecast looks favourable until thursday at this stage. The magic times for light and mood are usually the dawn and dusk and last night and this morning certainly didn’t disappoint. 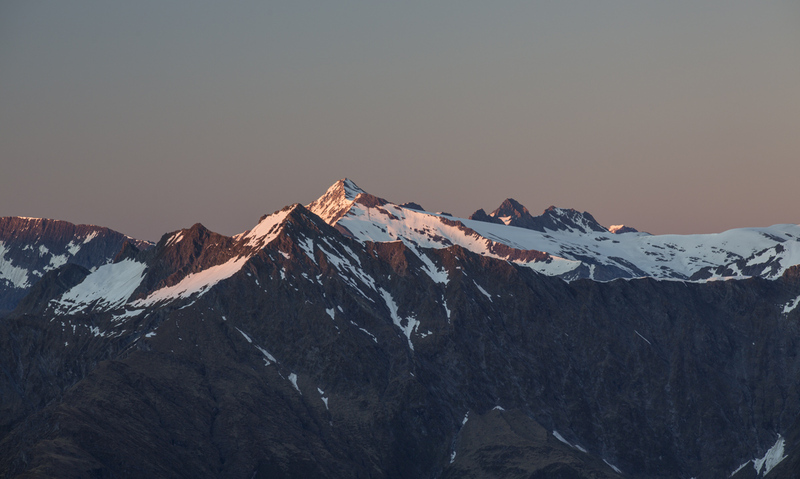 The last glimpse of sunlight that we usually see here is on the summit of Tititea to our west or if we are lucky on a clear day Aoraki & Tasman to the North East – much further away. Here is a glimpse of the ever changing light on Tititea at around 9.25pm last night. Last Light on Aspiring yesterday. 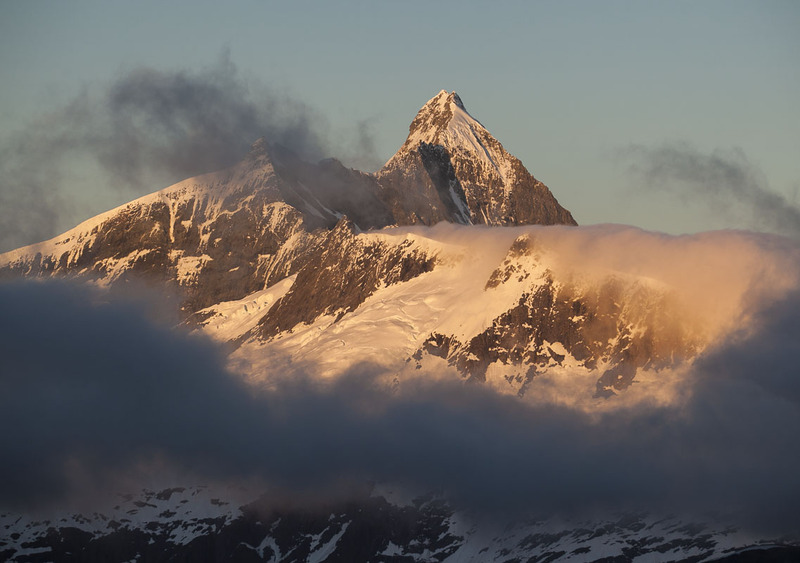 The First Light on the Mountain is usually no less dramatic. First Light on Tititea this morning. It has been difficult to choose a typical sunrise pic today so Ive uploaded two of them for you. The second was taken about five minutes later. First Light on Aspiring a few moments later. The view to the north at 90 degrees always captivates me and I often have difficulty deciding where I should be pointing the camera for the time lapse sequences that I have been creating.Typically the camera is usually dedicated to the specific scene and direction for at least an hour and changing ones mind can compromise the result. Here is the ridge to the north earlier this morning. I’m often asked the name of this range or the names of the peaks along it. The range doesn’t have an official name but the peaks do have official numbers. 1866, 1854, 1796, 1862, 1865 and right at the eastern end – the one on the right – 1920. (Perhaps we should call it the Orwell range?). 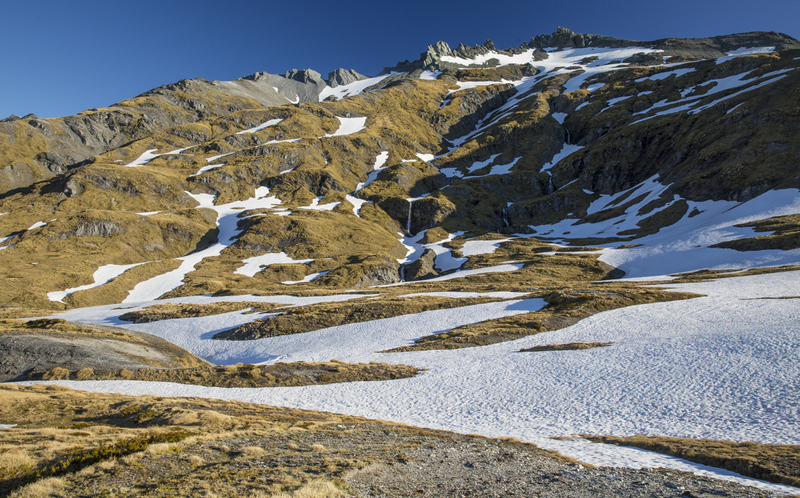 These are the current heights above sea level in metres. With global warming accelerating these will need to be renamed soon. 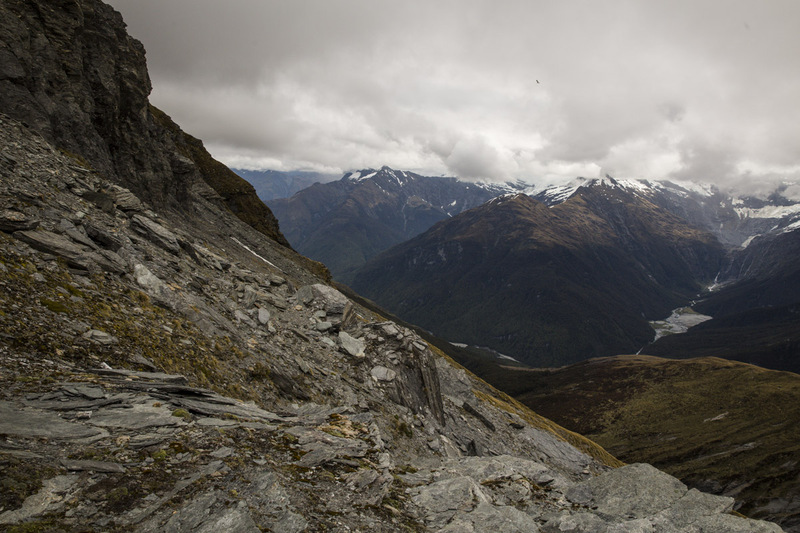 Peak 1866 (for now) above the Albert Burn Saddle. 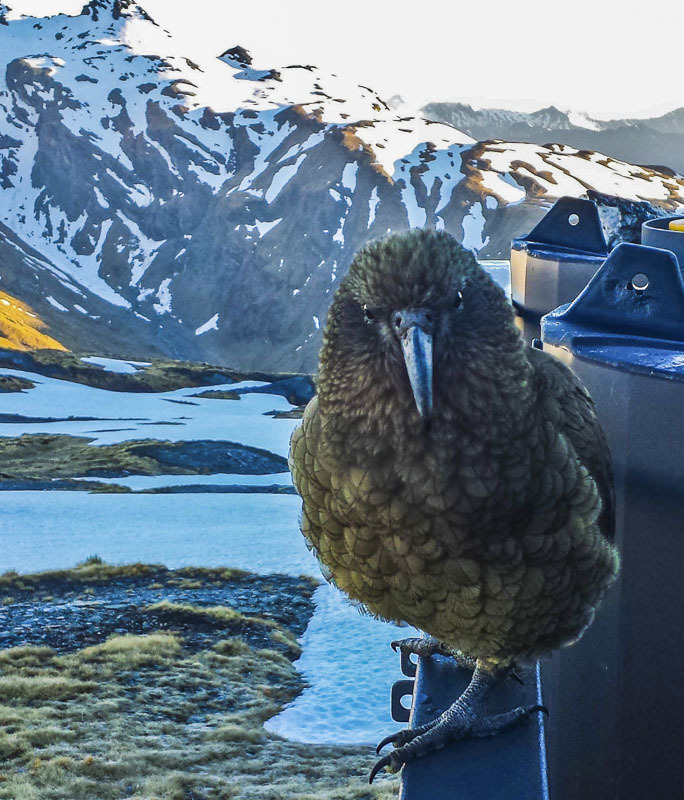 The Keas are usually on the job well before sunrise and always keen to see what we are up to. Last night one of the youngsters chewed most of the cork handles from one of my Leki Poles before I had a chance to rescue it. On our last trip here, one of them (a very smart adult bird) managed to fly away with one of my precious sheepskin gloves. Here is one of the juvenile birds standing by for some more mischievous action. 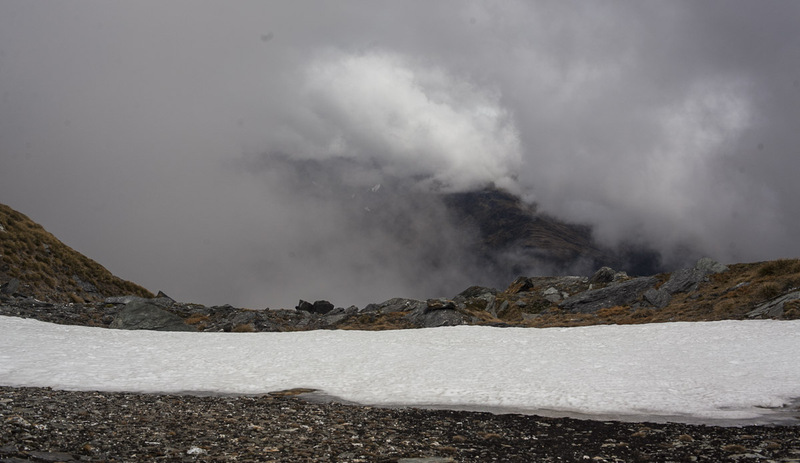 Glacier Dome to the North West of the saddle is a prominent land mark and frequently collects cloud around it. This morning was no exception. I am confident that the time lapse video of this is going to look great. Brook & his friend Rose from Taupo, who climbed Dragonfly Peak above the saddle yesterday afternoon, climbed peak 1866 after breakfast this morning before preparing to tramp out back to civilisation via Junction flat & the East Matukituki valley. Here is group shot of us just prior to them leaving. 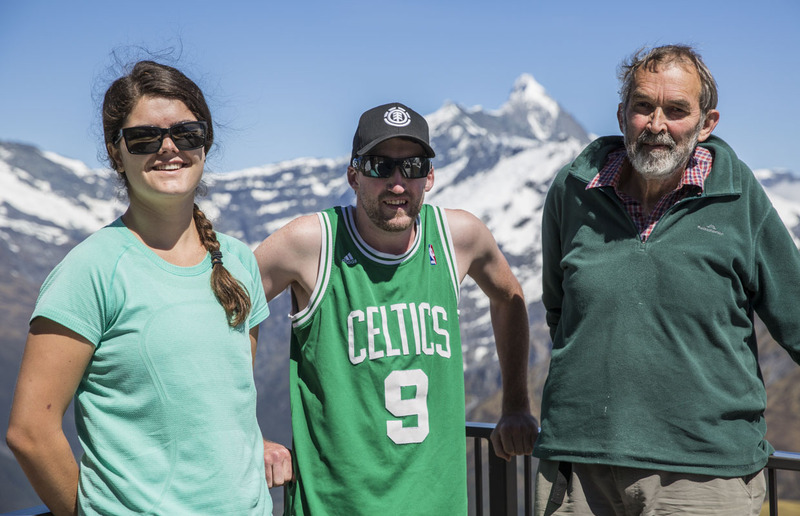 Rose Battersby, Brook & Gilbert van Reenen with Mt Aspiring in background. 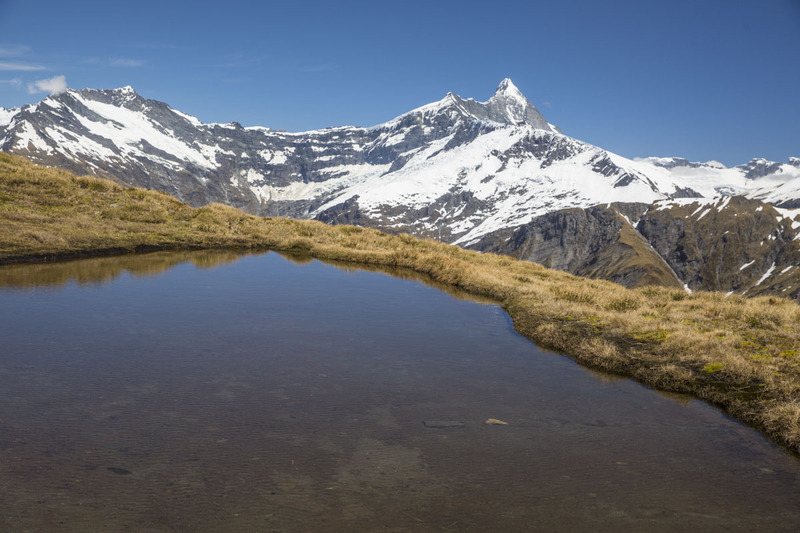 Their route takes them past this wonderful little tarn just above the saddle. 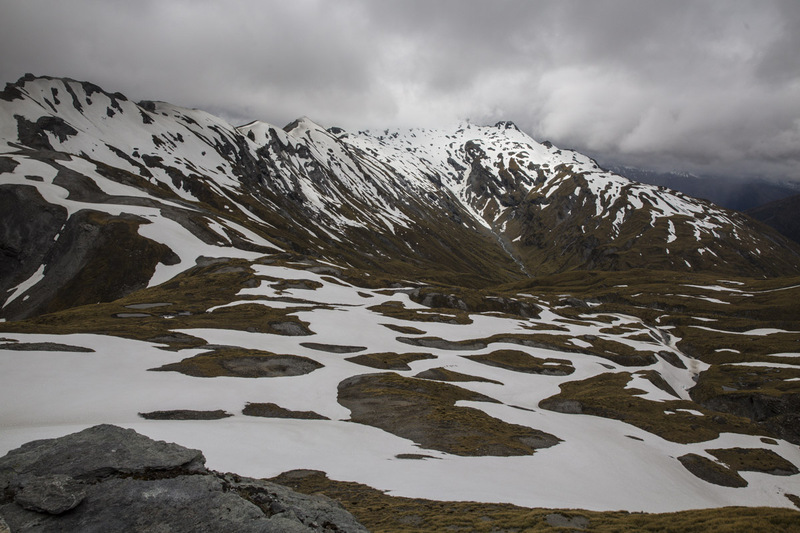 And their view to the north west for a time will include Mt Fastness & Glacier Dome shown here from above the Hester Pinney Creek. 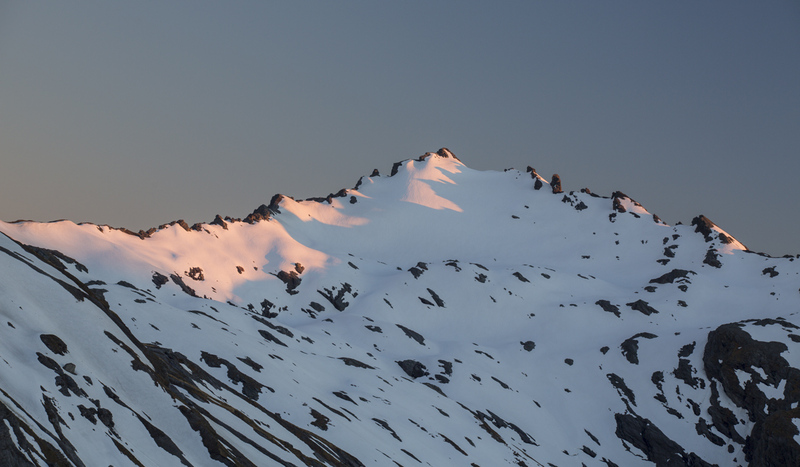 Another brilliant morning with a kea wakeup call in time to see the first light on Aspiring. What a way to begin the day. 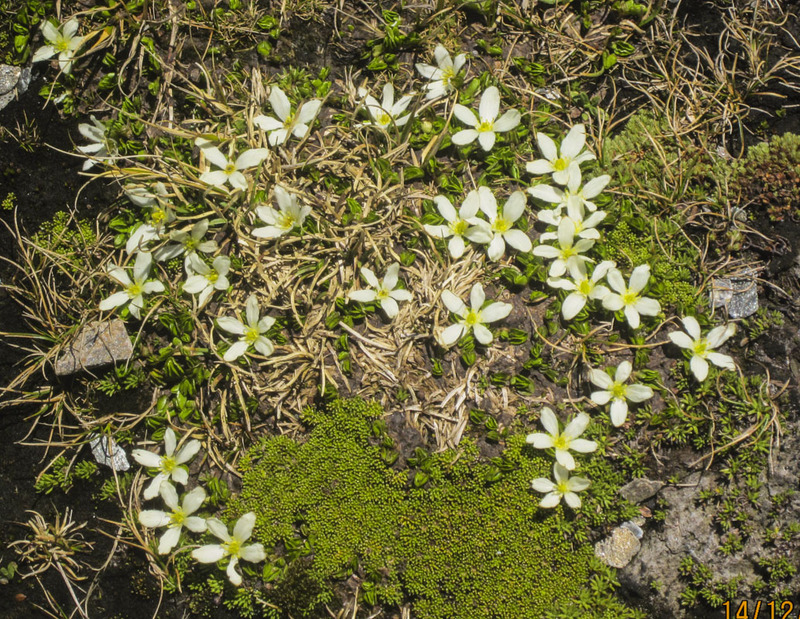 I went a little way down the valley with Brook and Rose as they left and wandered back up watching the grasshoppers everywhere enjoying the warmth and hoping for some flowers on the cushion plants. 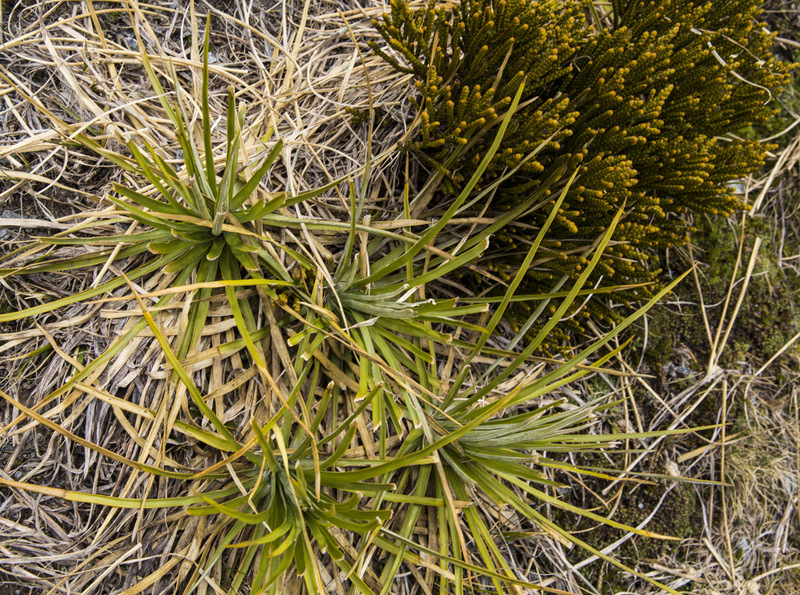 And I was in luck with this find – we’ve spent the last hour trying to identify it, but I’m sure that will be easier with a better photo of the foliage. 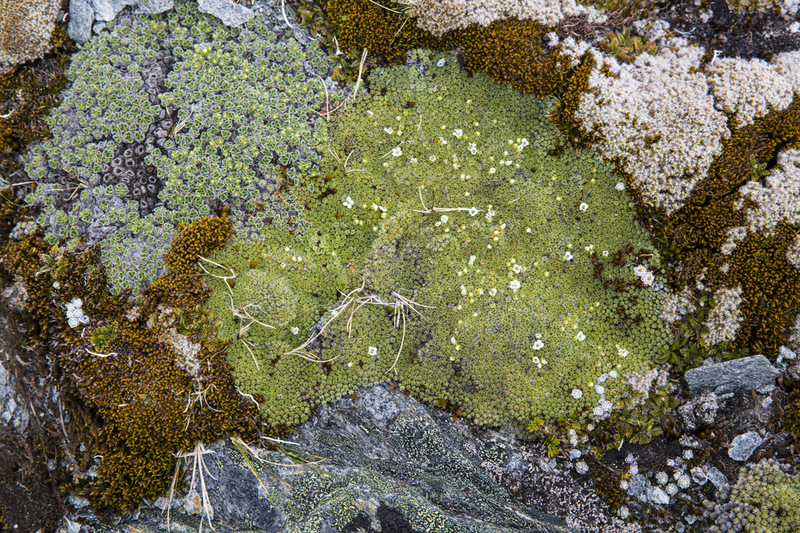 The contrast is fascinating – these tiny tightly whorled plants against the massive peaks and glaciers, the sharp limey greens against the stark black and white. The weather on the flight in with Charlie Ewing of Aspiring Helicopters was fantastic and the forecast looks great for several days. The views were quite different to when I was last here in September with much of the surounding snow melted. 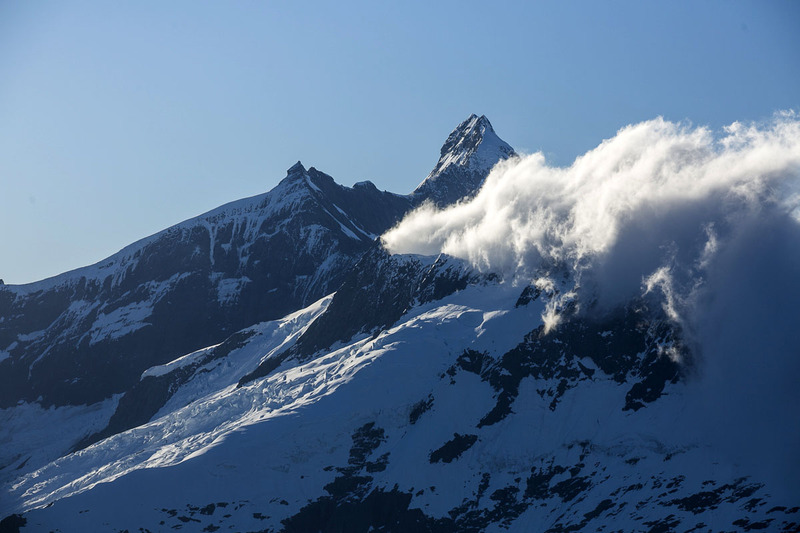 Here is one of our first views of Aspiring from the chalet with orographic cloud swirling over the volta glacier in the lee of the big mountain. This time I am accompanied by my wife Robyn who has been here before in the autumn about seven years ago. She is really pleased to be back too. You will hear more from her later. Here one of the adult birds carries on from where he left off last time and continues his attempt to wreck all of the rubber parts of my tripod head. While one of the youngsters shows off. 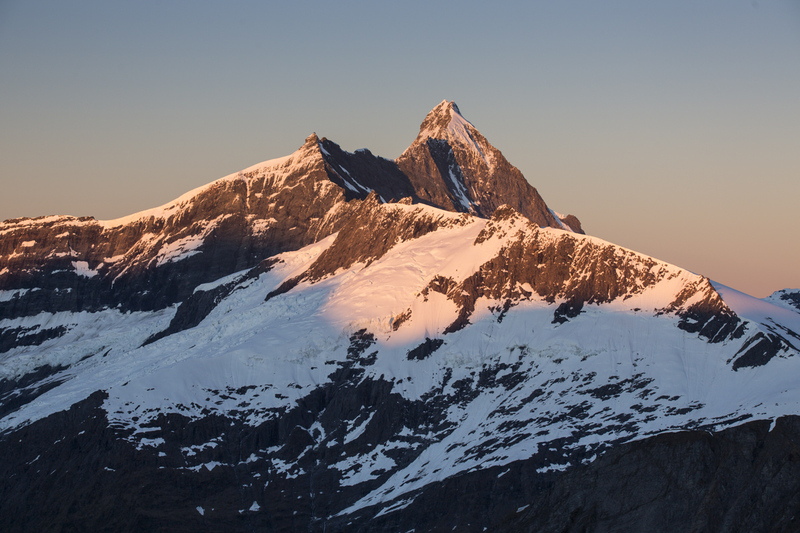 The visual effect of the last sunlight on Mt Aspiring was as stunning as ever. Ive mentioned previously that the clarity of the night sky is spectacular. 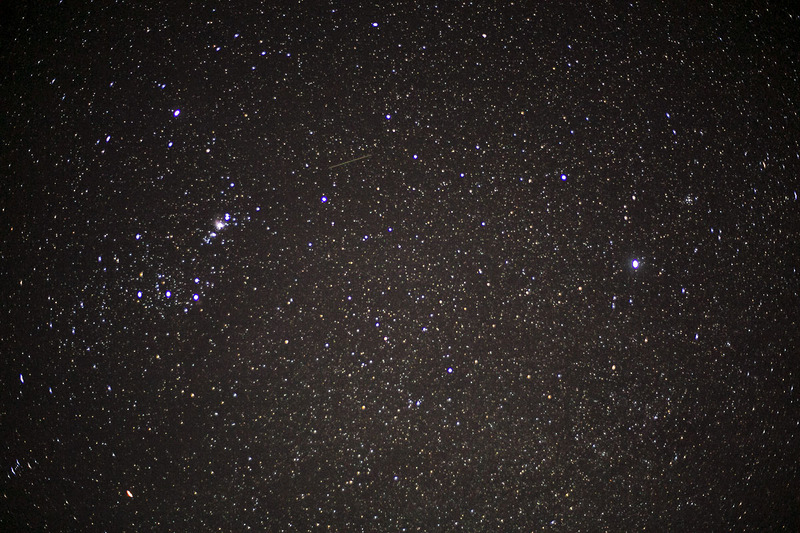 Here is a view to the south east with just a standard lens. This time we are somewhat limited with the ability to upload video & time lapse sequences so will share these with you on our return. This afternoon our son Brook arrived with a friend Rose Battersby a fellow adventurer. 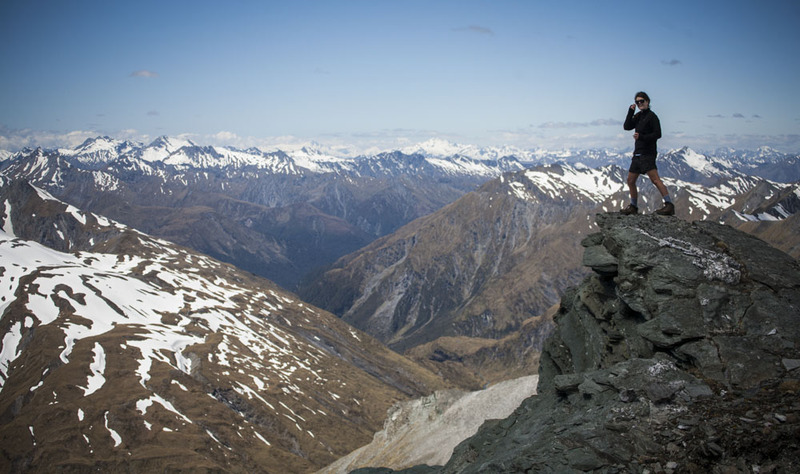 They promptly left for a climb of Mt Dragonfly (2165 metres) above the saddle to gain stunning 360 degree views. 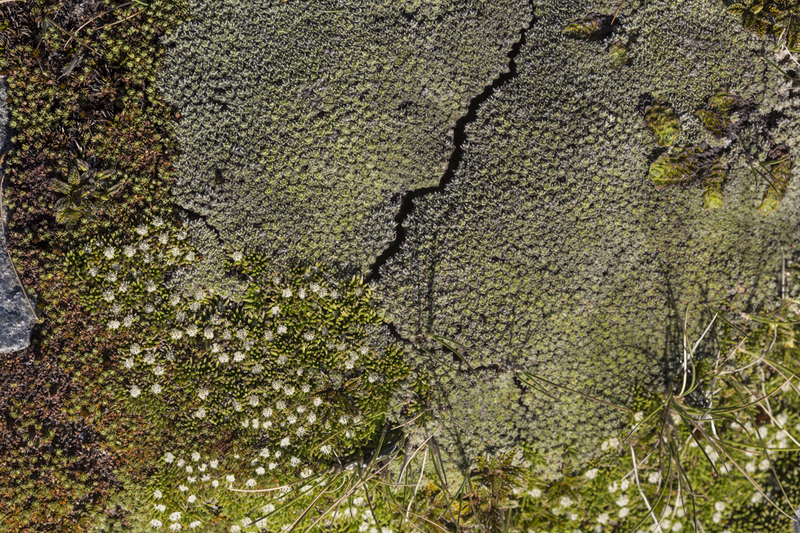 Here is one of Brook’s images from near the summit. Rose (lion king) Battersby near the summit of Dragonfly peak. Photo by Brook van Reenen. 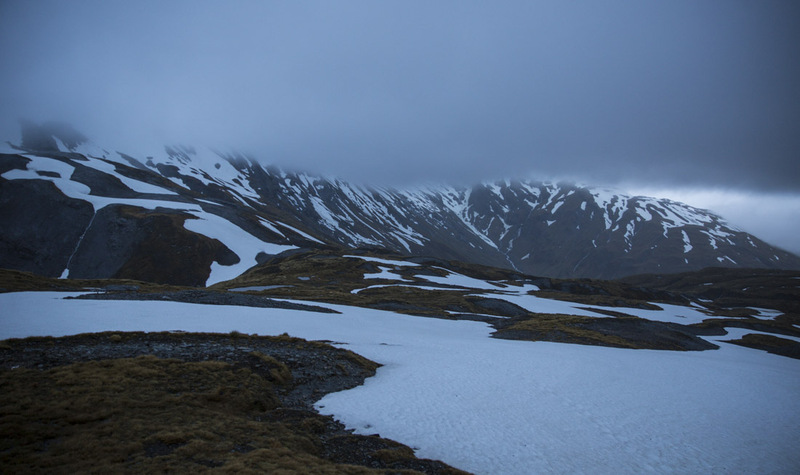 Rose and Brook will be walking back down to Cameron Flat at the Junction between the East & West branches of the Matukituki valley tomorrow. 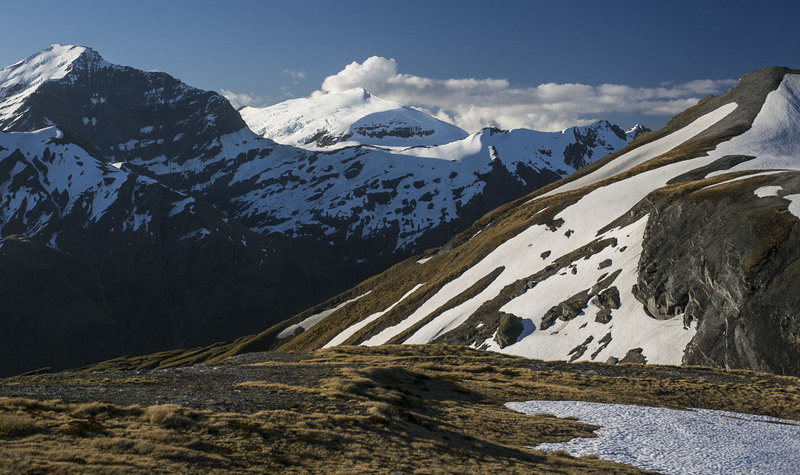 They will join the high level track from Junction Flat above the Bledisloe Gorge to Ruth Flat. 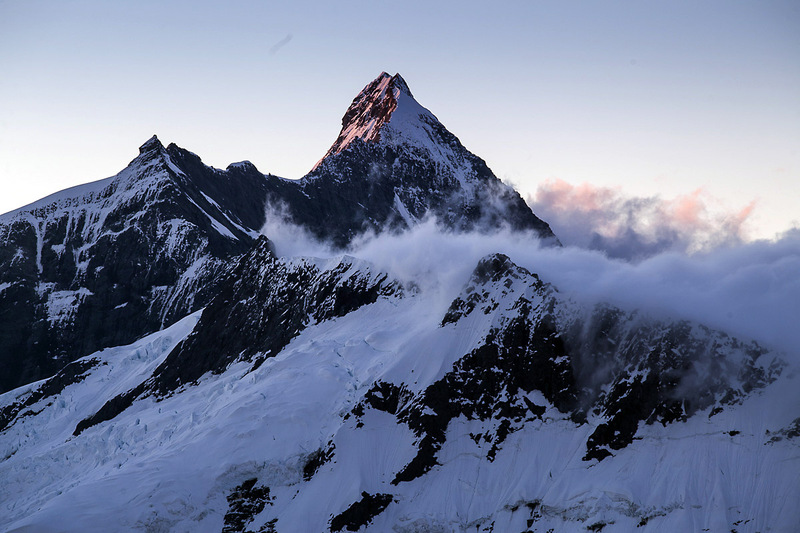 The stunning East Face of Mt Fastness which regularly enthrals us from here rises directly from Ruth Flat. Ill leave the last word for tonight to Robyn. This is her very first Blog Posting so let us have a good drum roll please. What a delight to be in the chalet looking out on such a spectacular landscape. As on the last trip James has loaded us up with a delicious array of fine food. Last night’s salmon with salsa verde and fennel and orange salad was superb. I think I’m following Erica in falling completely for the crazy keas. The antics, particularly of the half feathered youngsters, is hilarious. 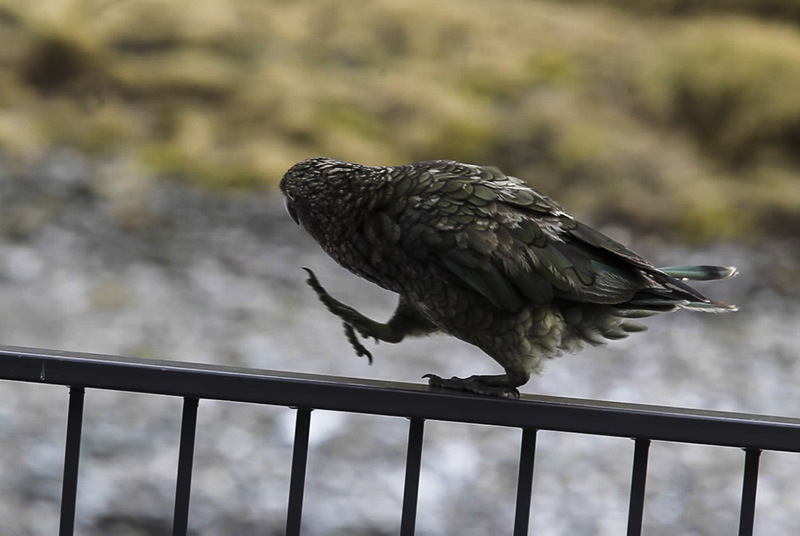 Trying to walk with their pigeon toes along the deck rail is a real challenge: one has mastered quite a nifty wide step while the other flounders along with feet and wings in all directions – laugh out loud entertainment. Yvonne on The Rainbow Connection – coincidence or not? Erica on The Rainbow Connection – coincidence or not?